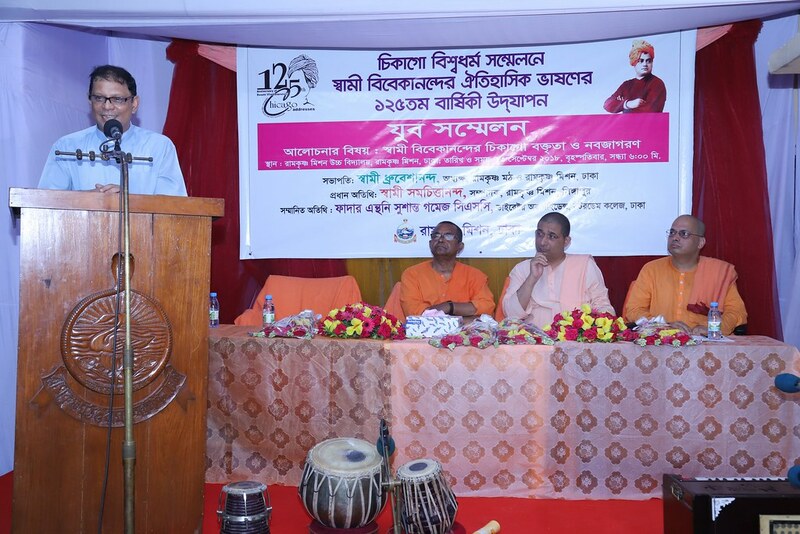 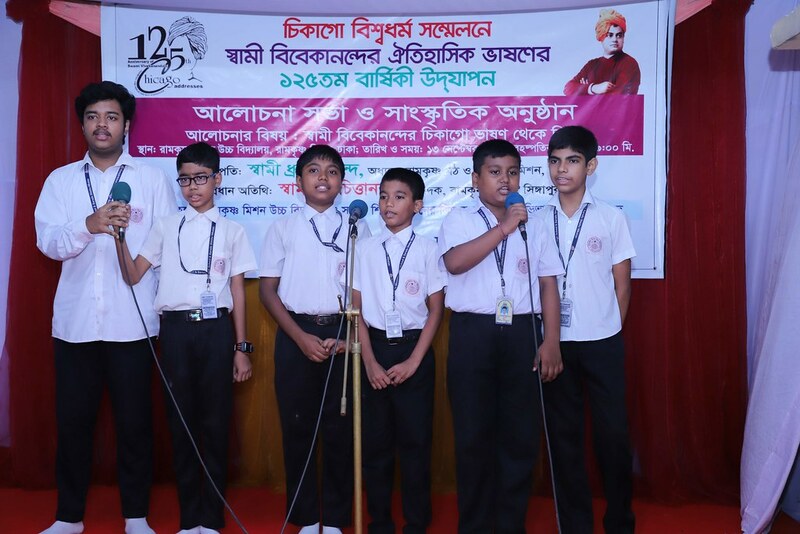 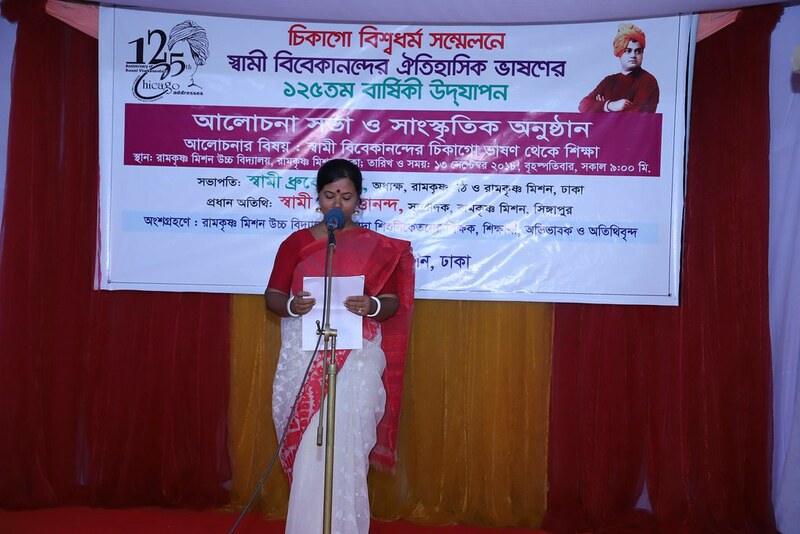 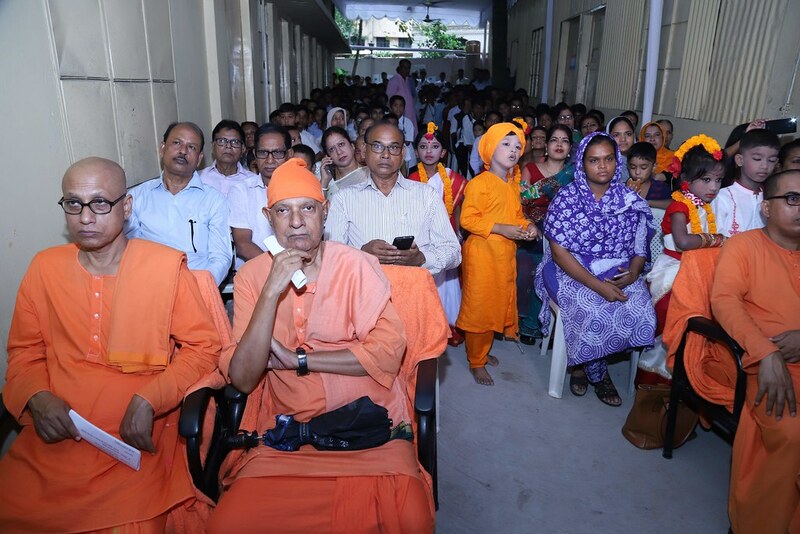 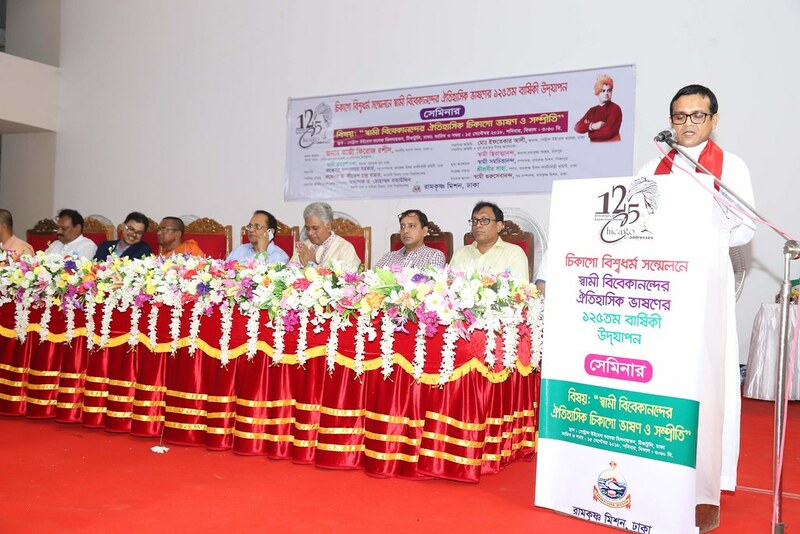 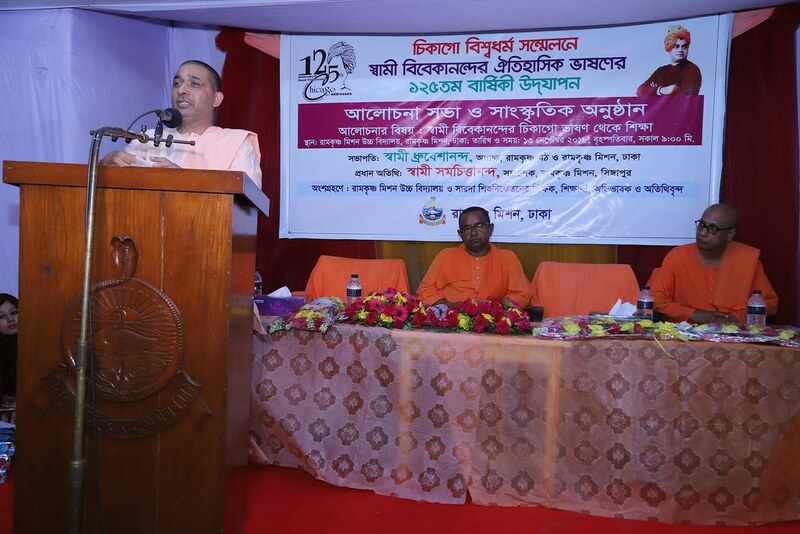 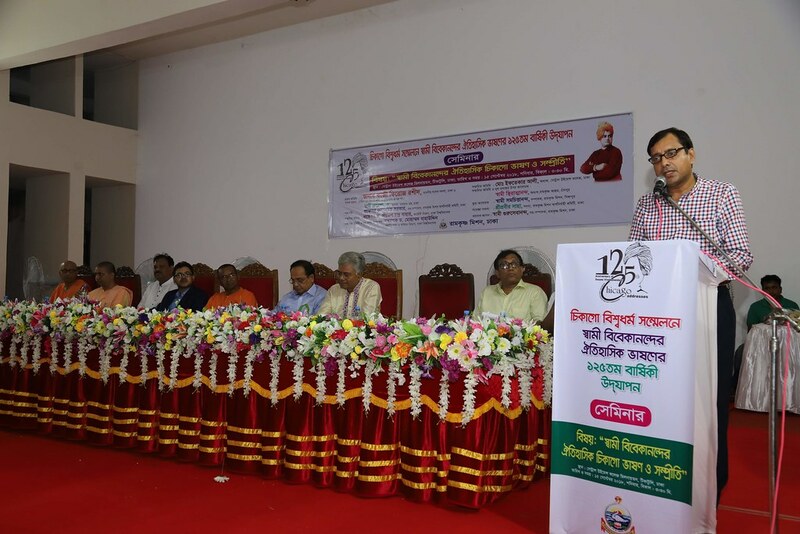 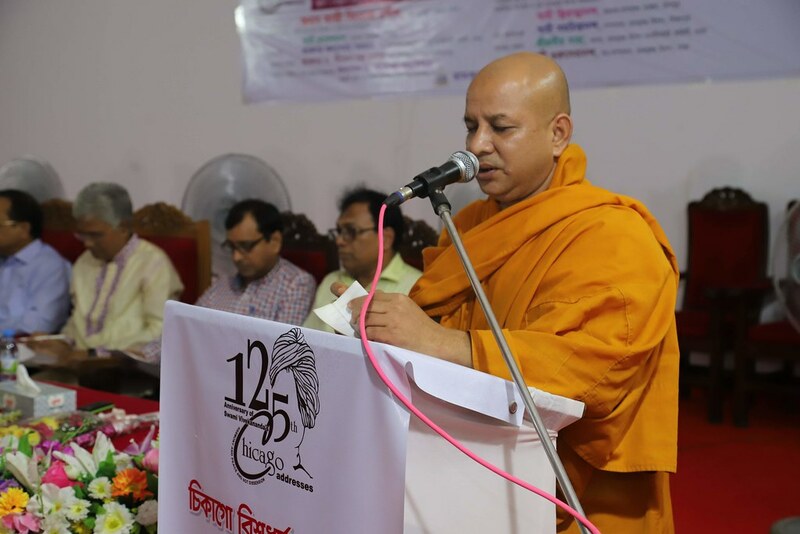 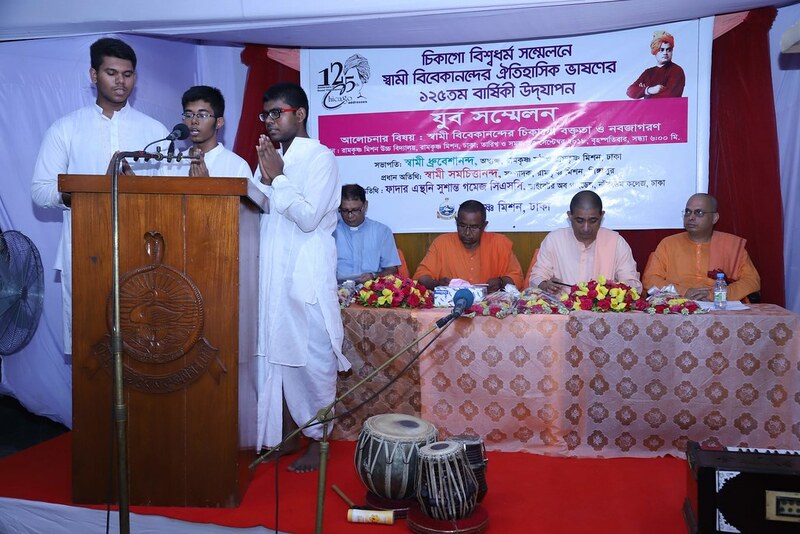 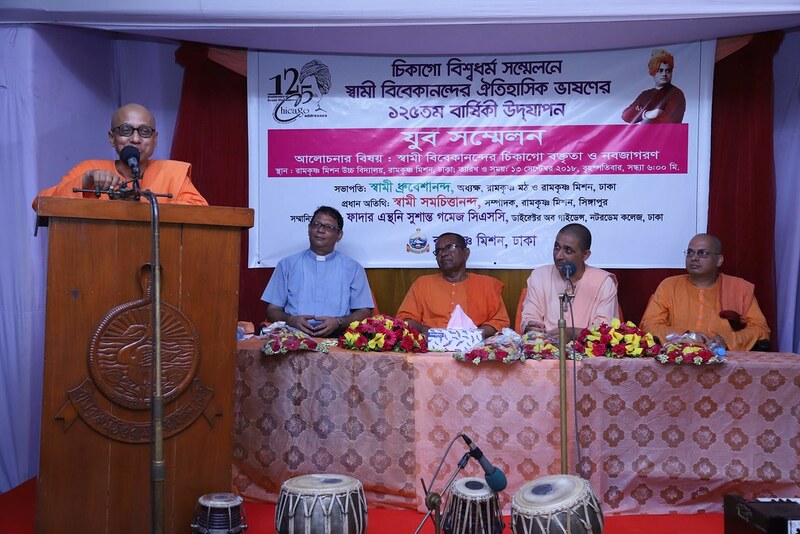 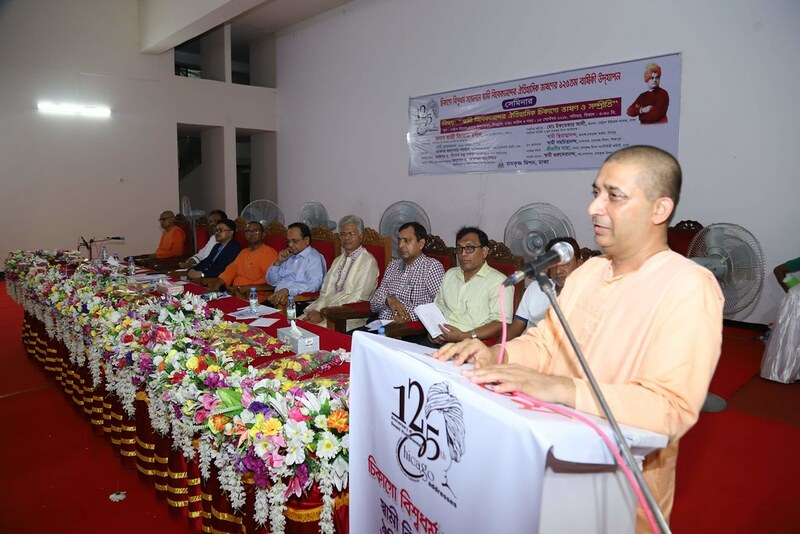 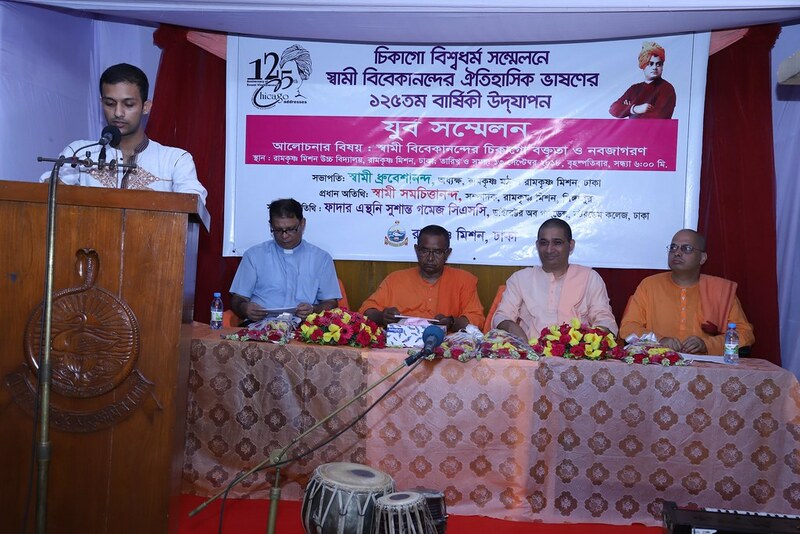 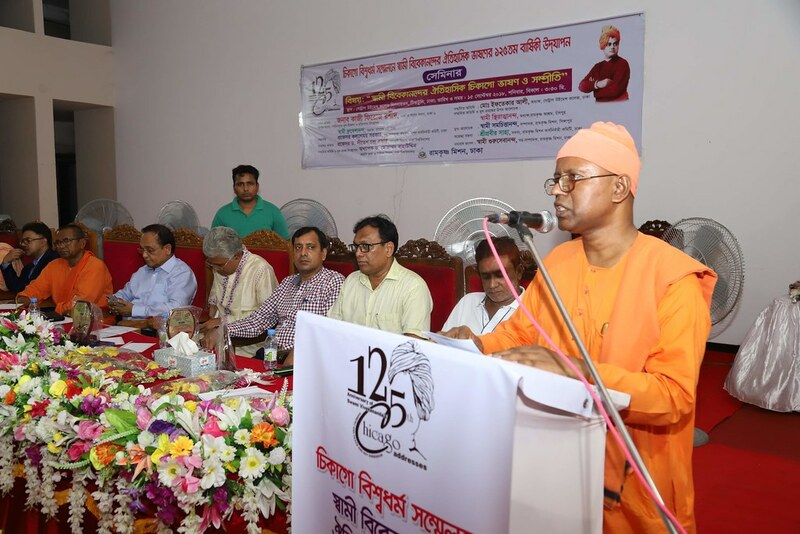 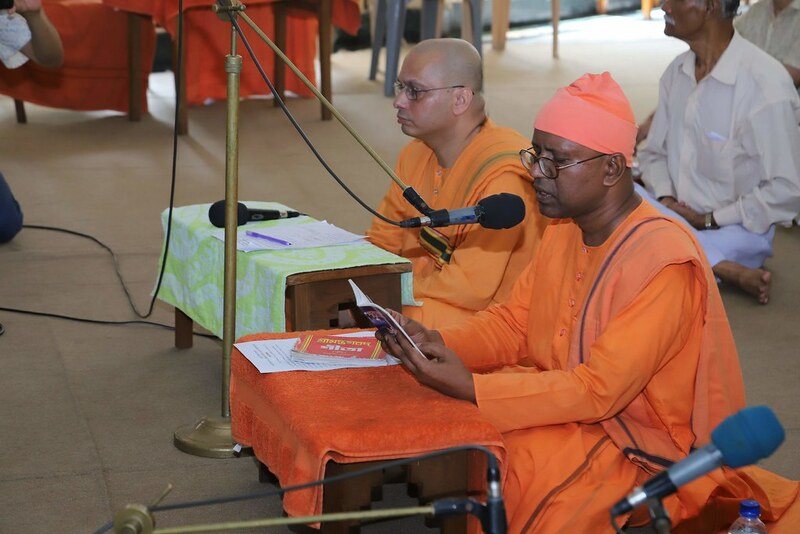 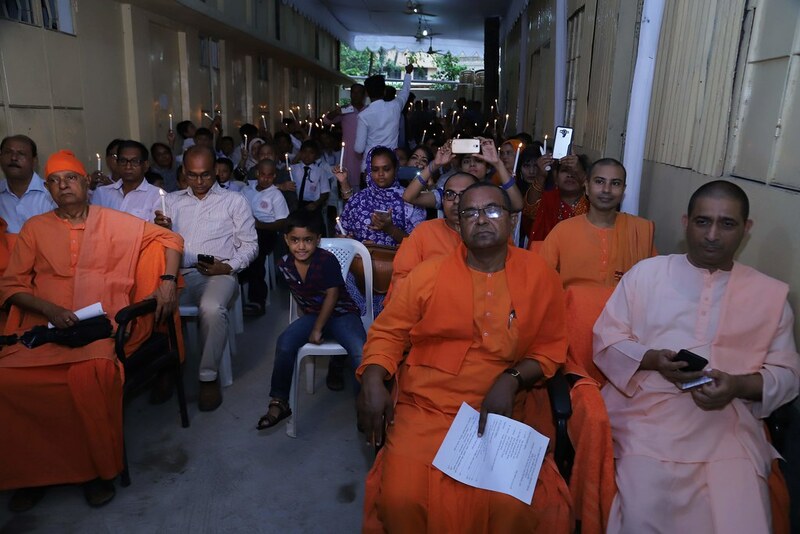 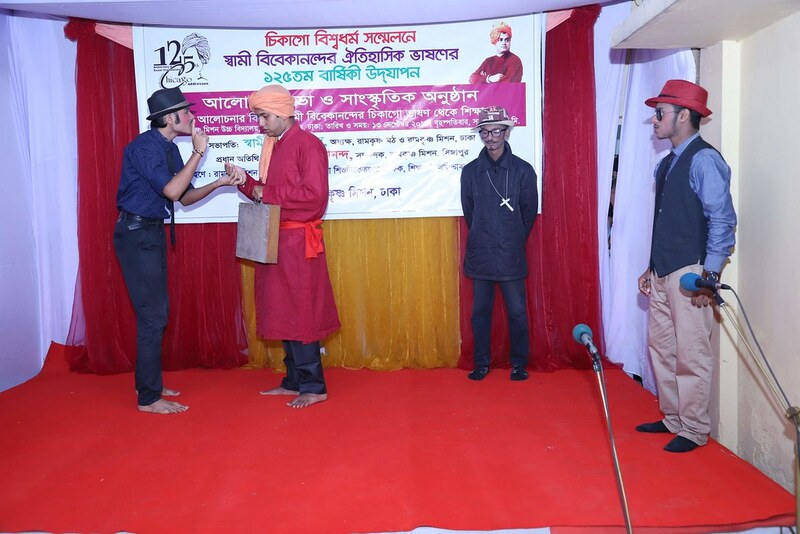 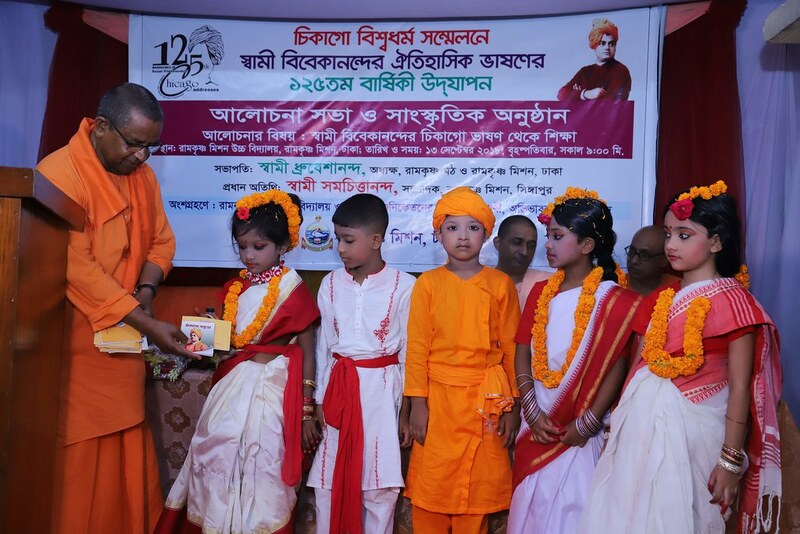 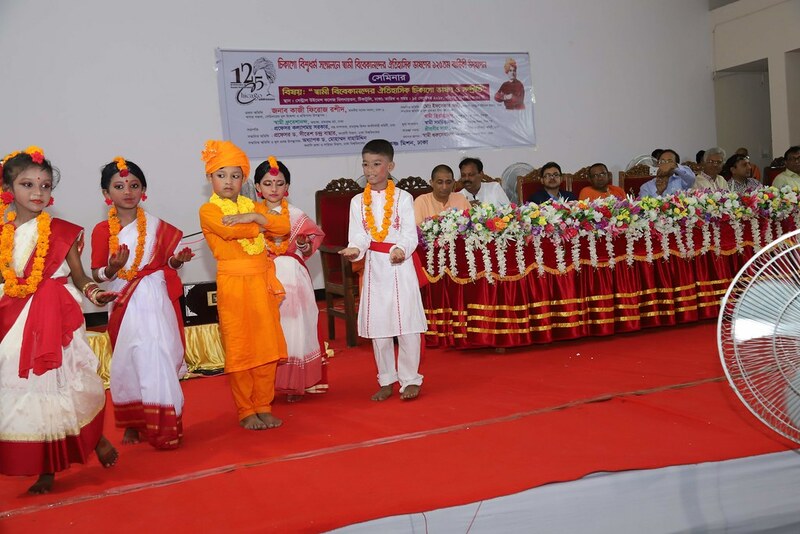 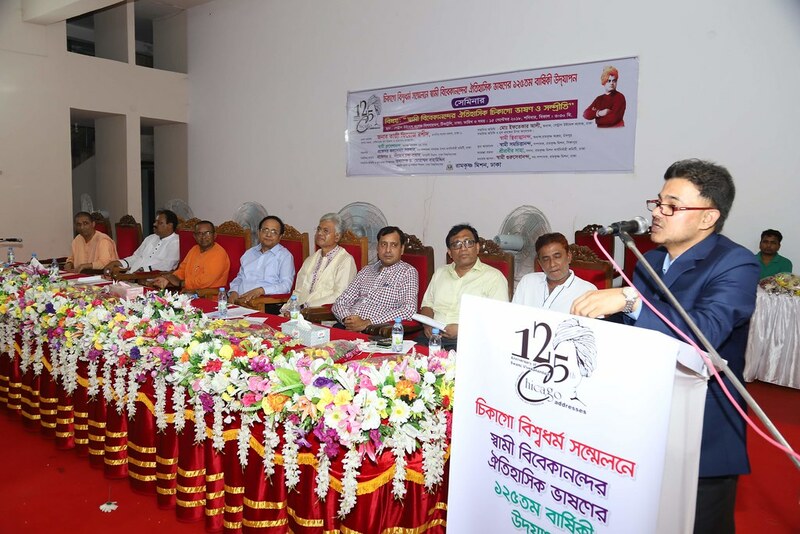 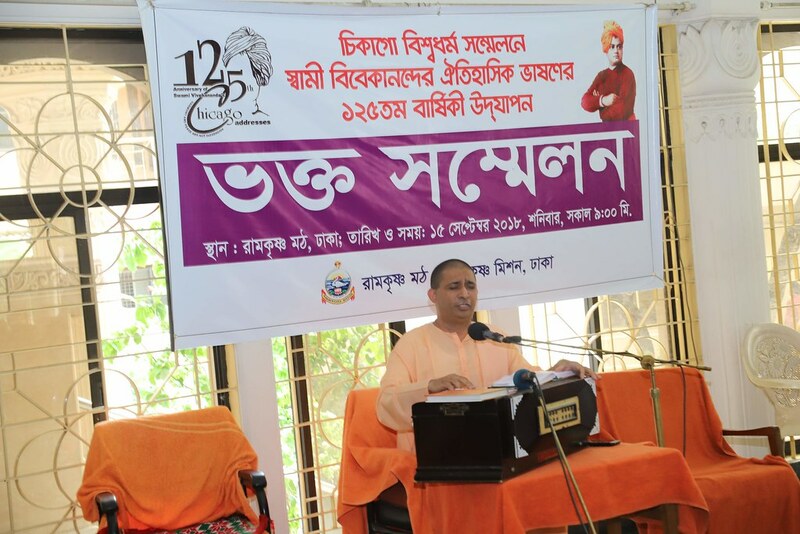 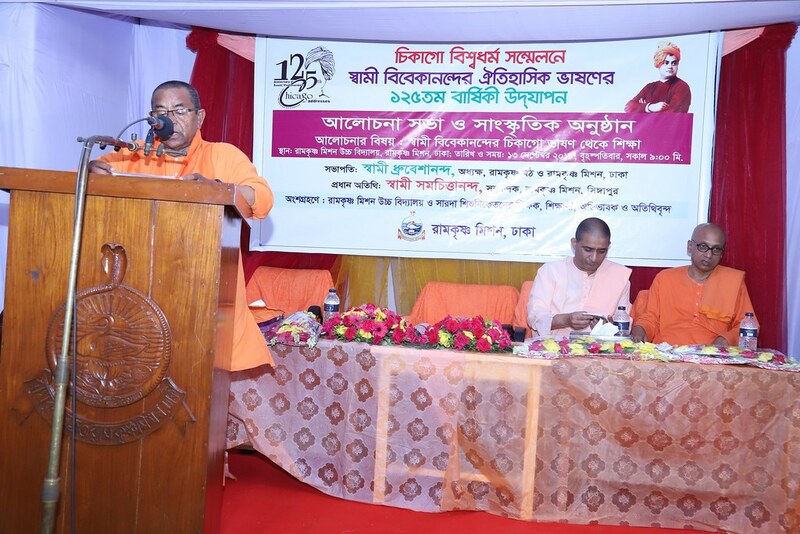 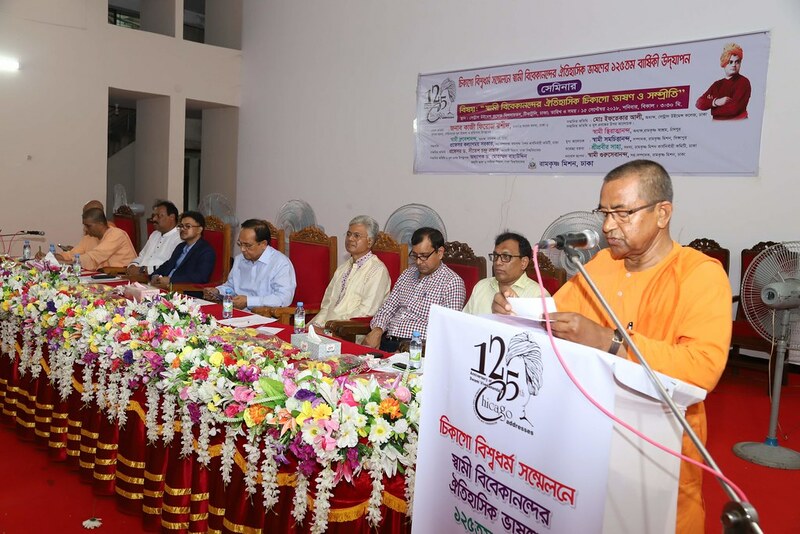 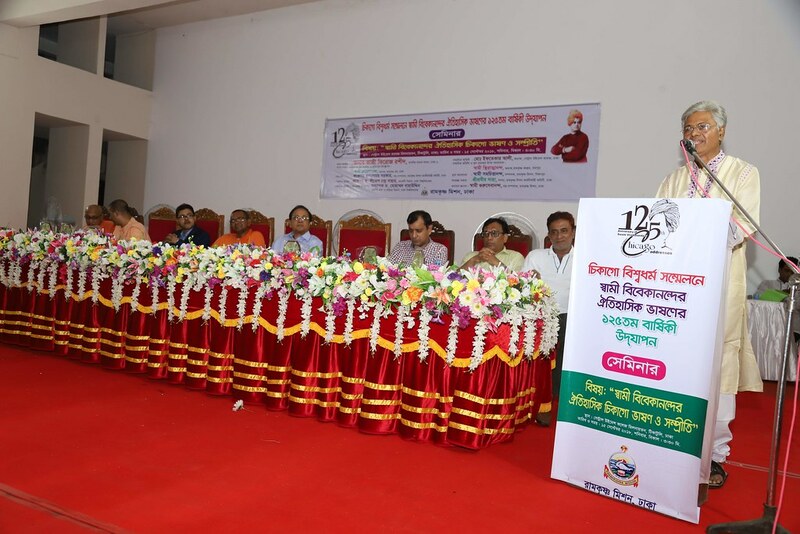 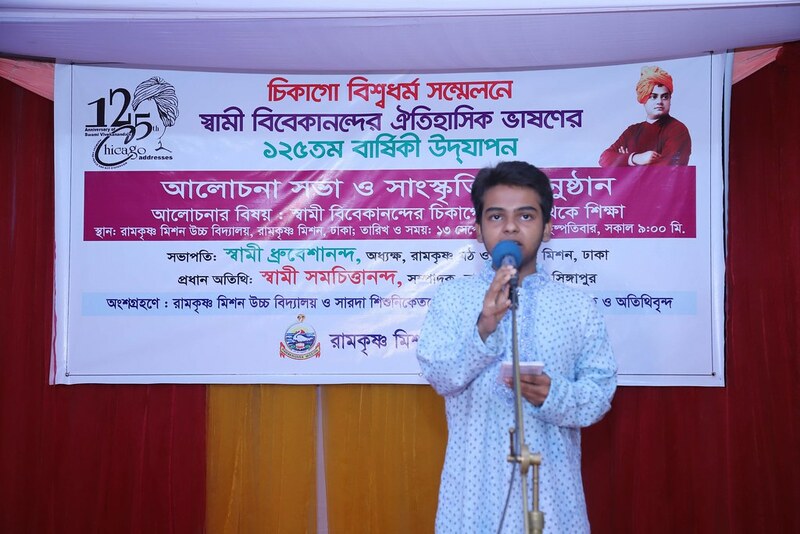 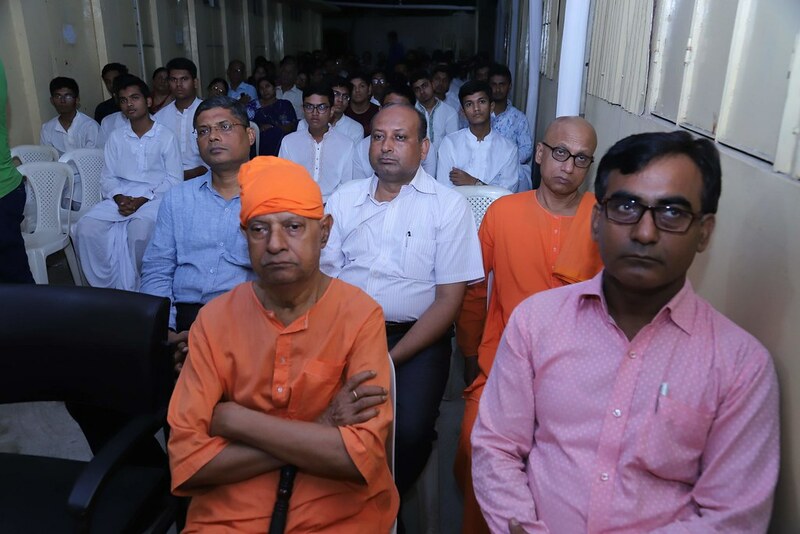 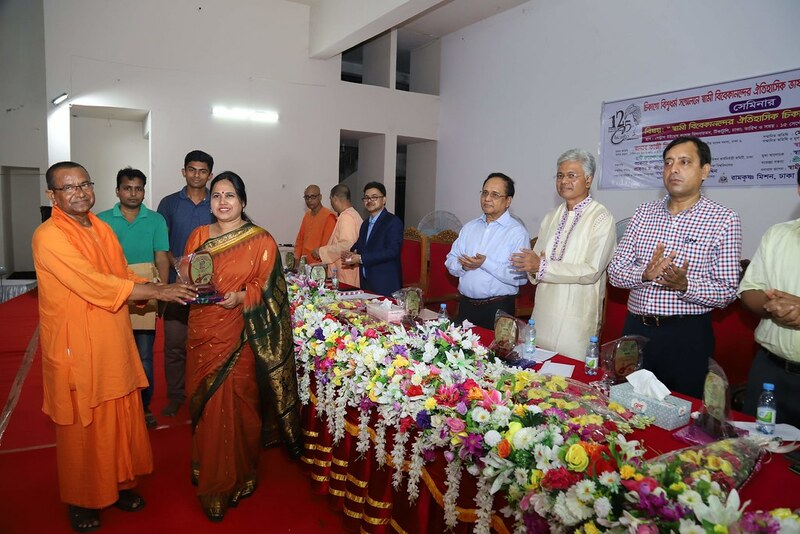 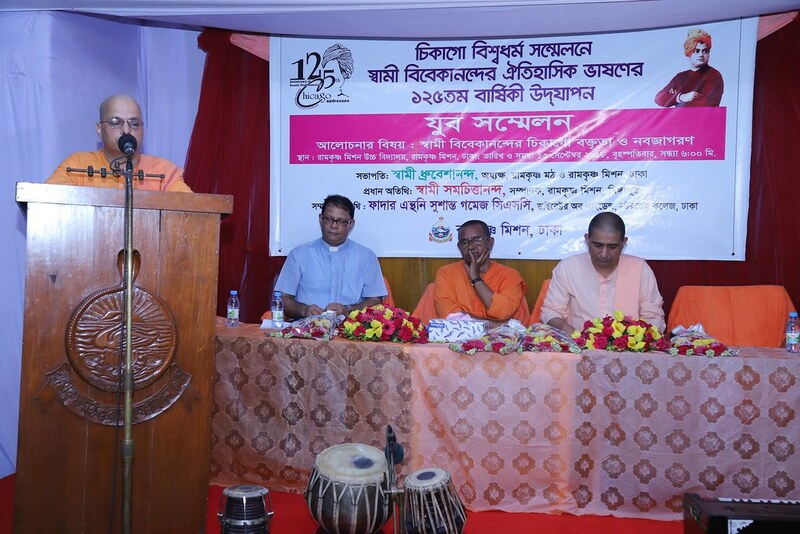 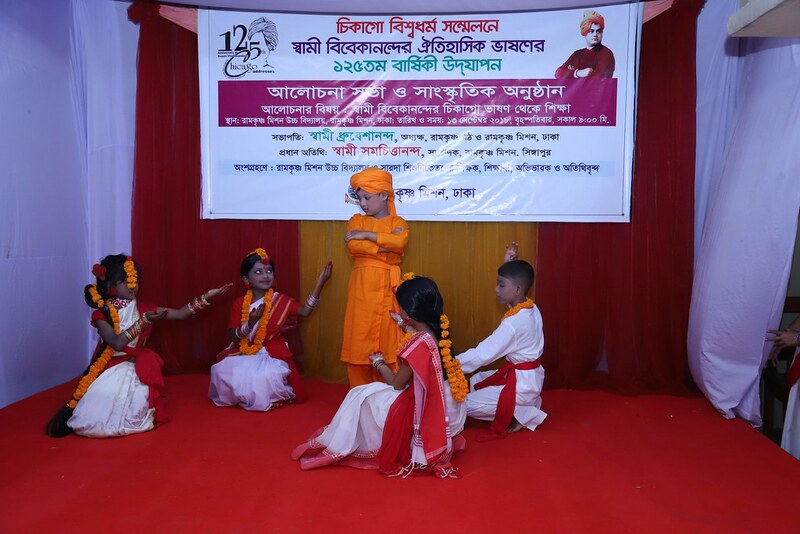 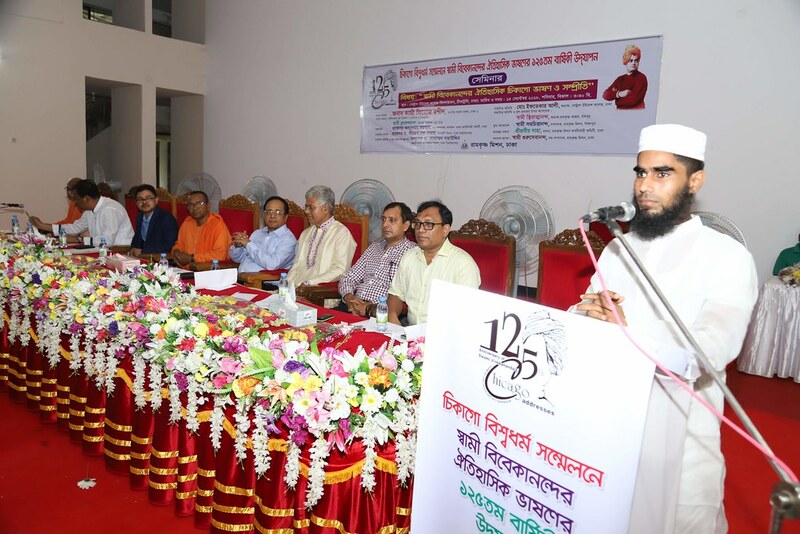 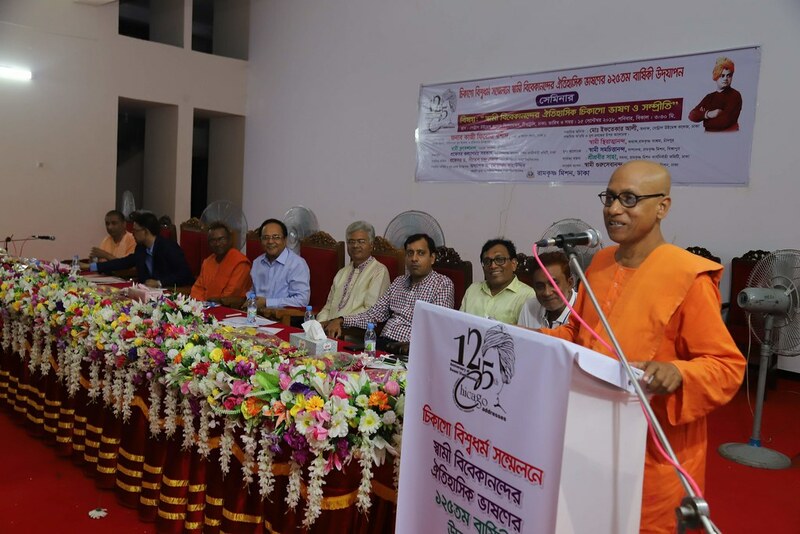 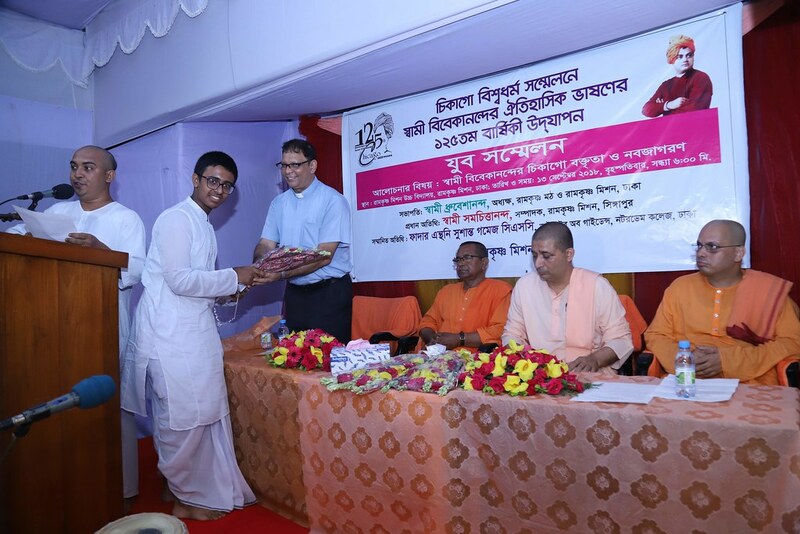 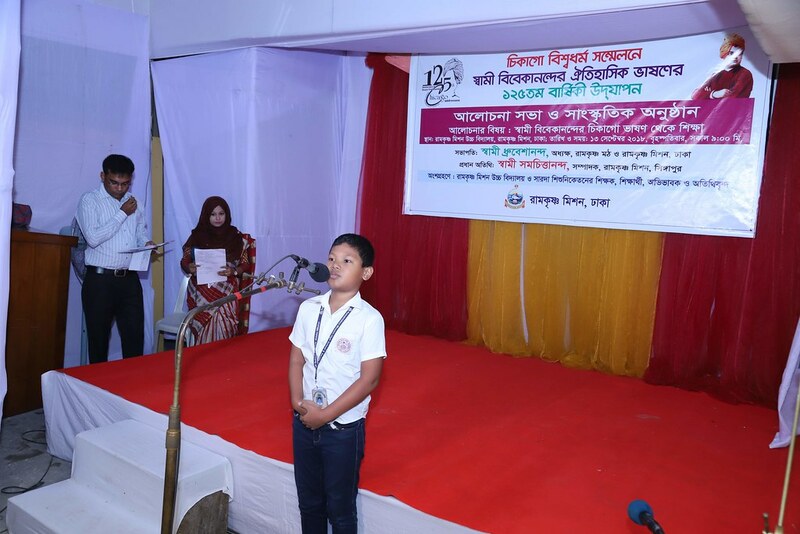 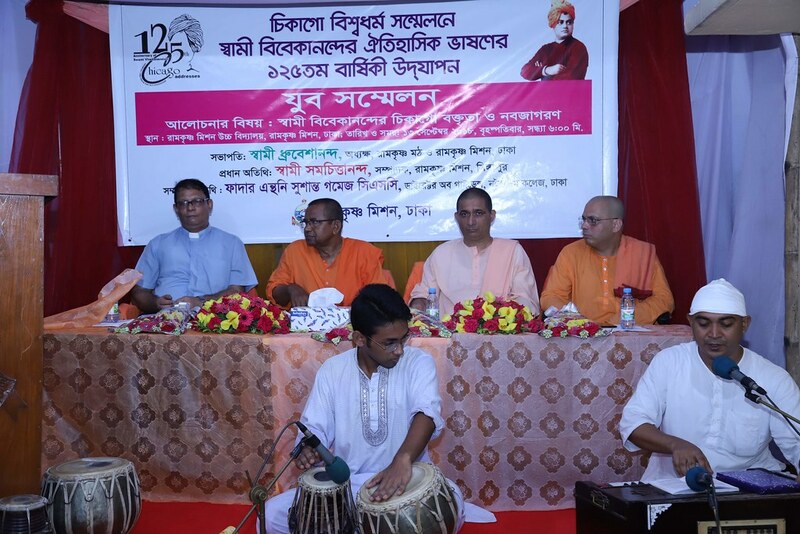 Ramakrishna Mission, Dhaka celebrated the 1125th Anniversary of Swami Vivekananda’s Chicago Addresses with a series of programs from September 13 to September 15, 2018. 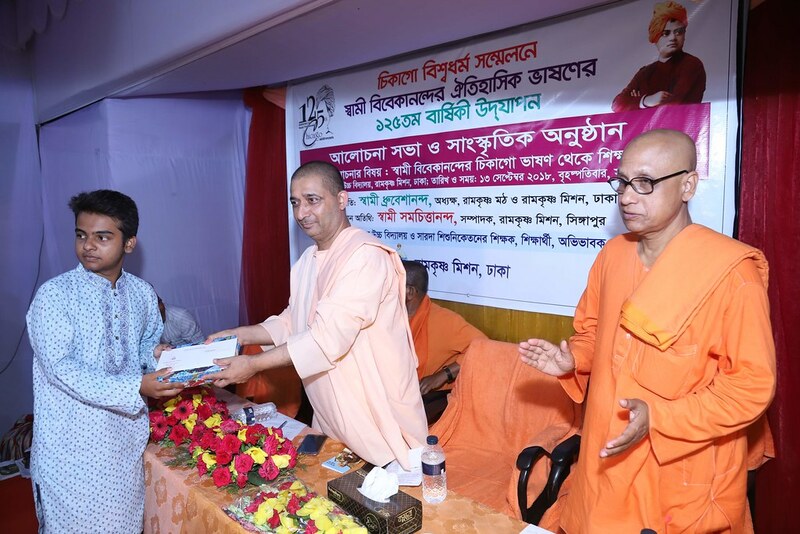 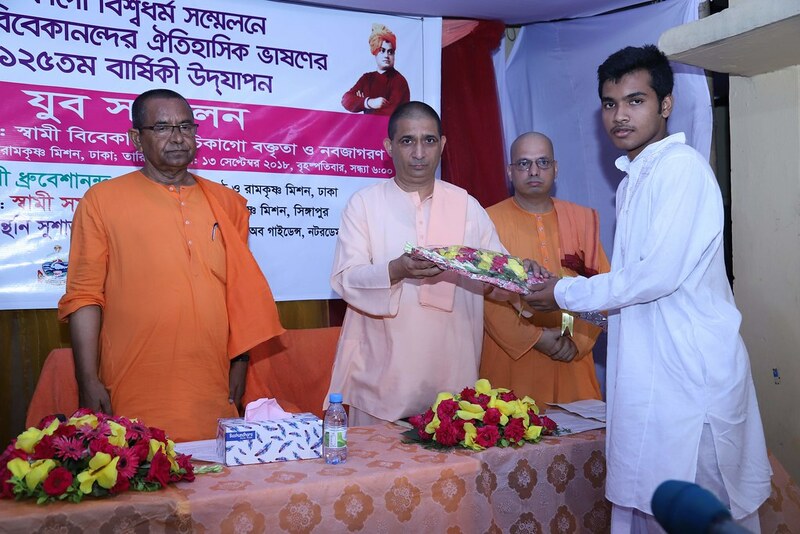 September 13, 2018 was marked by a discussion meeting, a cultural function, felicitation program for the scholar students who obtained good results in the SSC Examination in 2018 from Ramakrishna Mission High School, and distribution of “Dr. 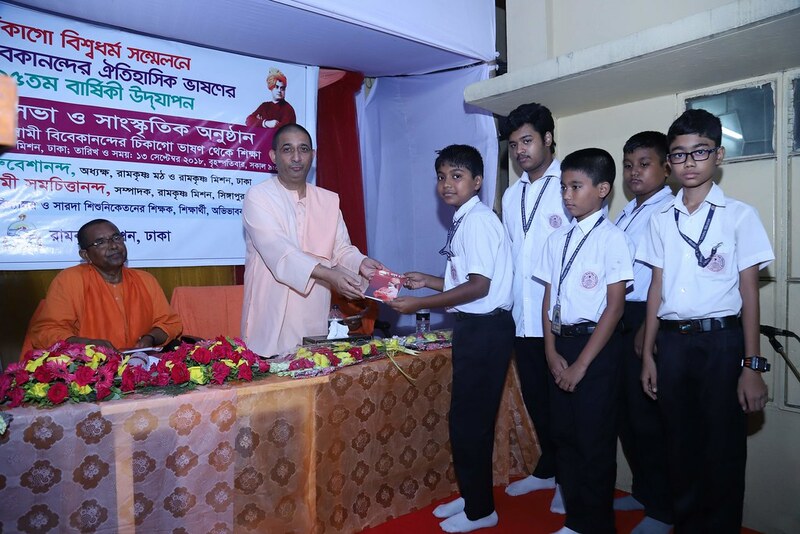 Govinda Chandra Dev Stipend” to the needy students of the school in the morning. 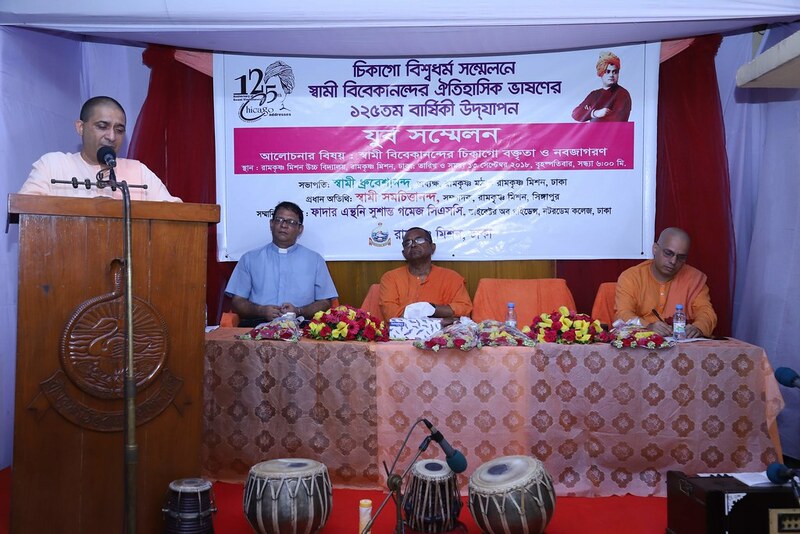 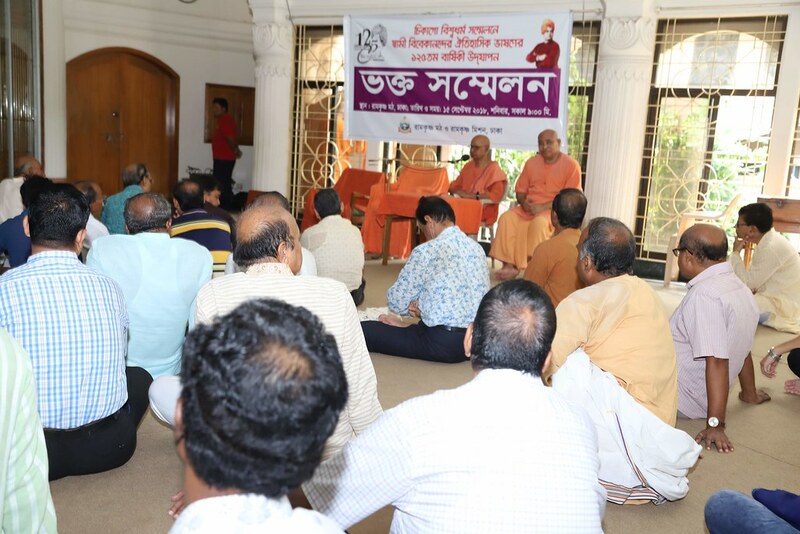 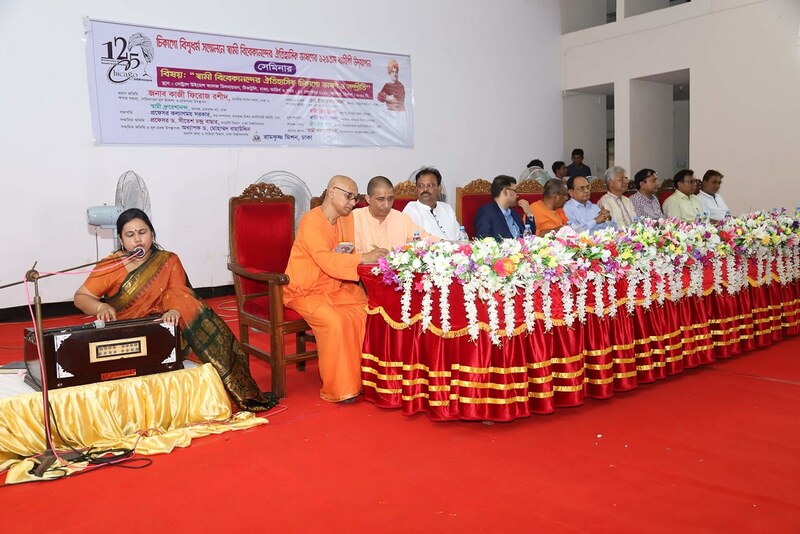 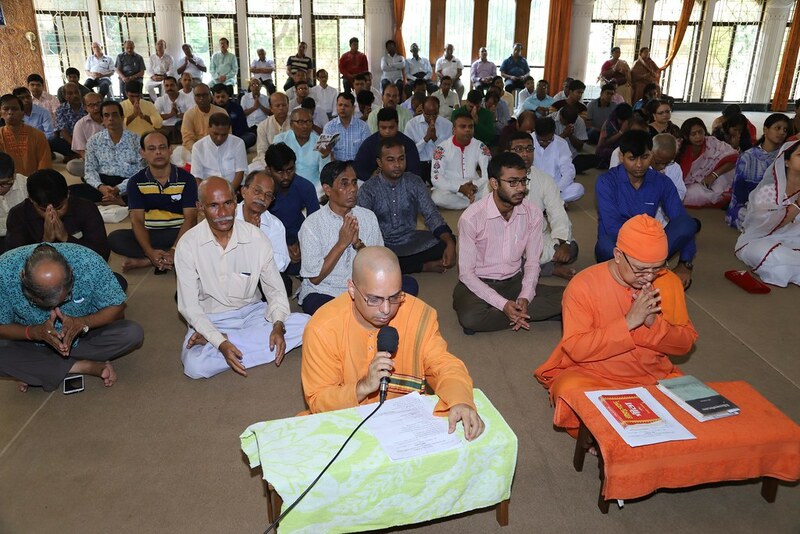 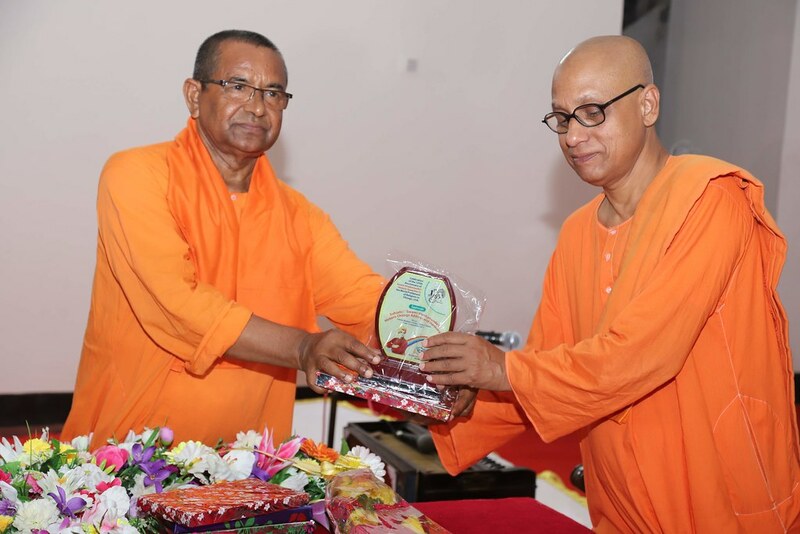 The discussion meeting titled “Learning from the Historic Chicago Addresses of Swami Vivekananda” was addressed by Swami Samachittanandaji Maharaj, President, Ramakrishna Ashrama, Singapore and Swami Sthiratmanandaji Maharaj, Secretary, Ramakrishna Ashrama, Chandpur as the Hon’ble Guests. 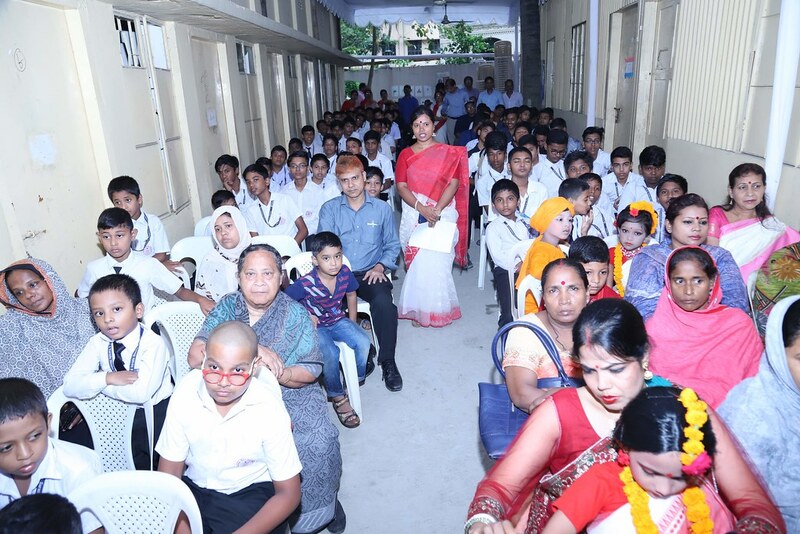 About 300 people including students, teachers, guardians and invited guests attended the program. 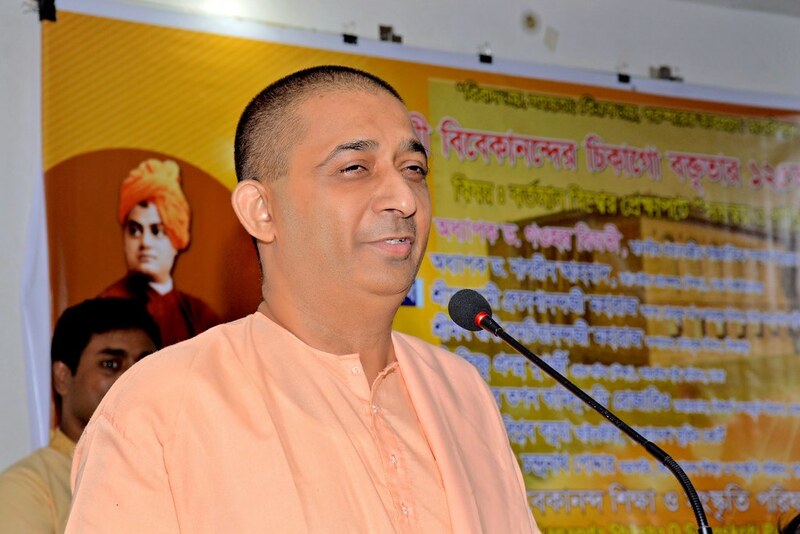 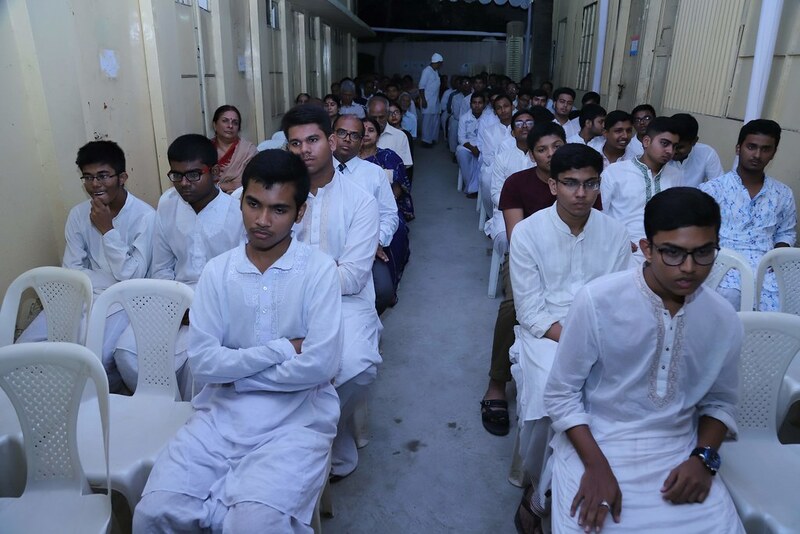 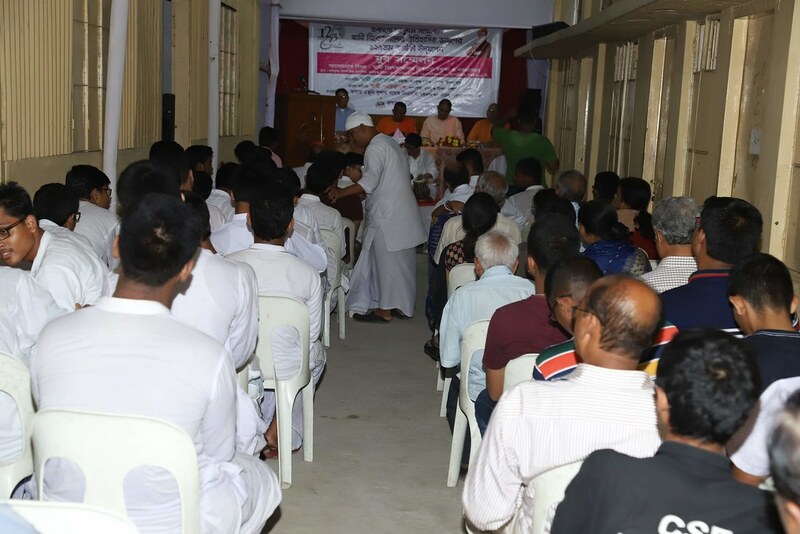 A youth convention along with a discussion meeting titled “Swami Viveknanda’s Historic Chicago Addresses and Awakening” was held in the evening on the same day. 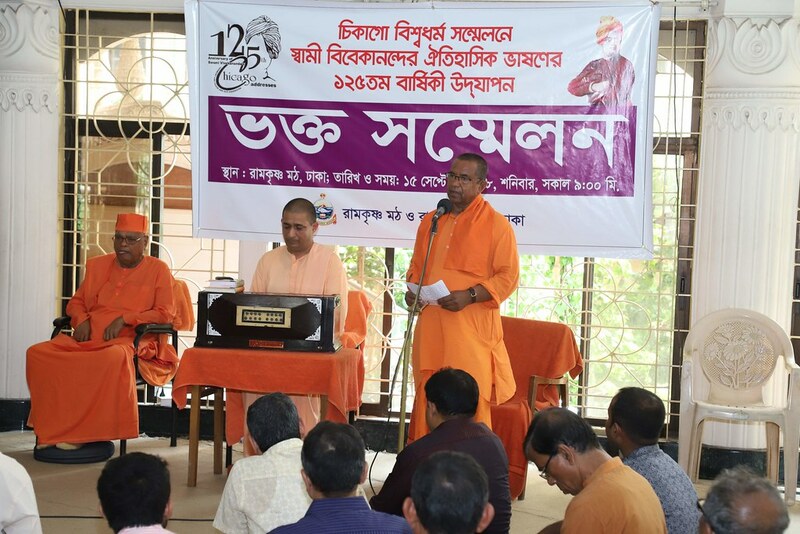 Swami Samachittananda Maharaj and Fr. 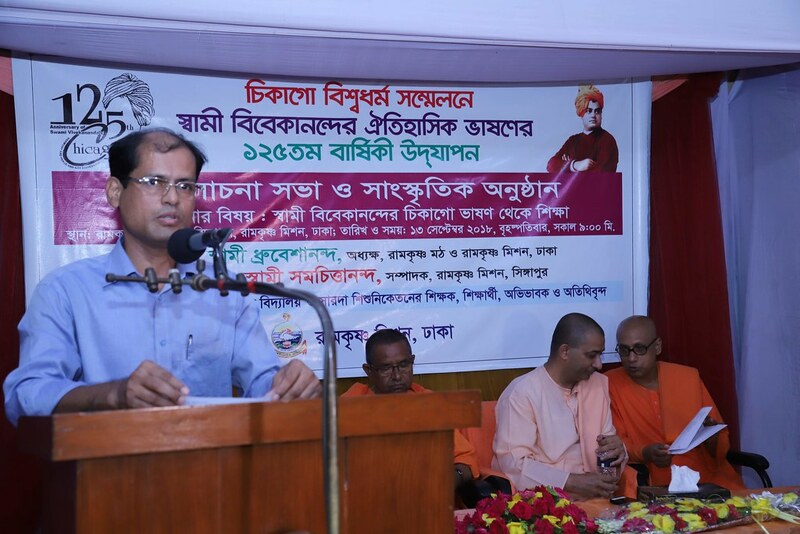 Anthony Sushanta Gomes addressed in the convention as the Chief Guest and the Guest of Honor respectively. 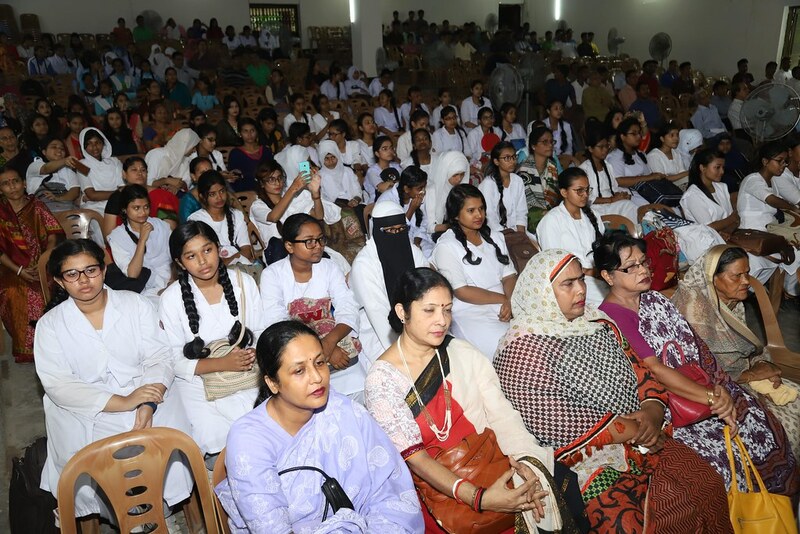 About 500 youths including the dignitaries attended the convention. 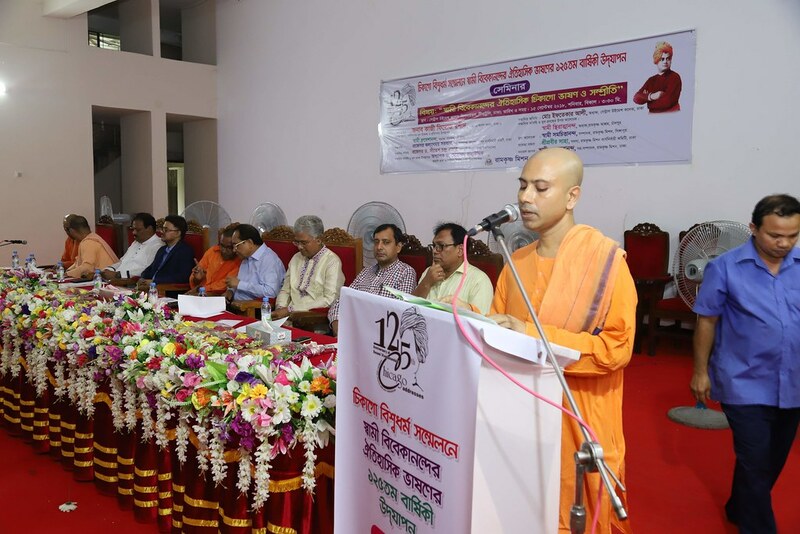 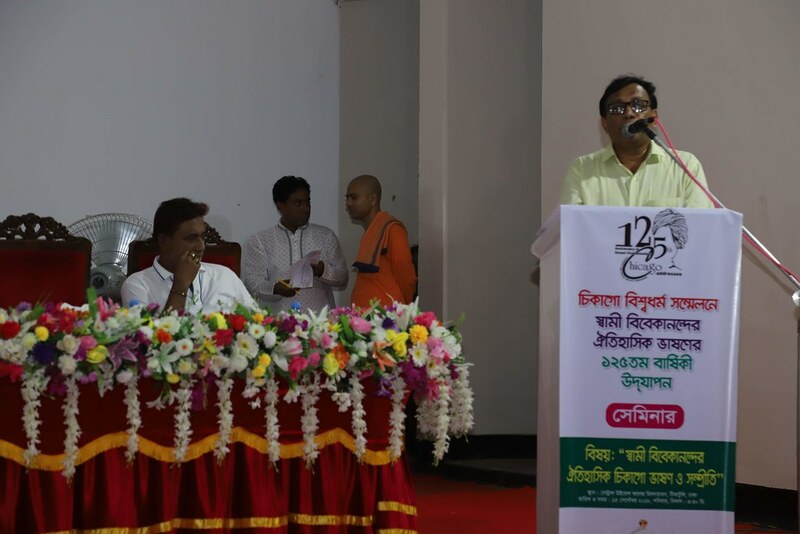 A seminar titled The Ideal of Harmony and Peace in the context of Present World, organized by Vivekananda Shiksha O Sanskriti Parishad, Bangladesh, patronized by Ramakrishna Mission, Dhaka, was held at Mazaffar Ahmed Chowdhury Hall, University of Dhaka on 14 September 2018 at 4:00 p.m. 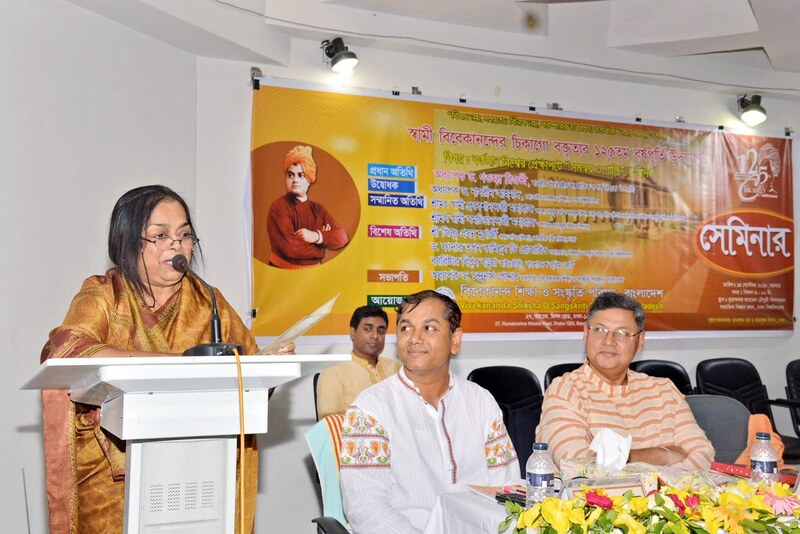 Professor Dr. Nasreen Ahmed, Pro-Vice Chancellor (Education), University of Dhaka, inaugurated the seminar and Prof Dr. Gawher Rizvi, Advisor to the Hon’ble Prime Minister on International Affairs addressed the seminar as the Chief Guest, and Swami Samachittananda spoke on the occasion as the Guest of Honor. 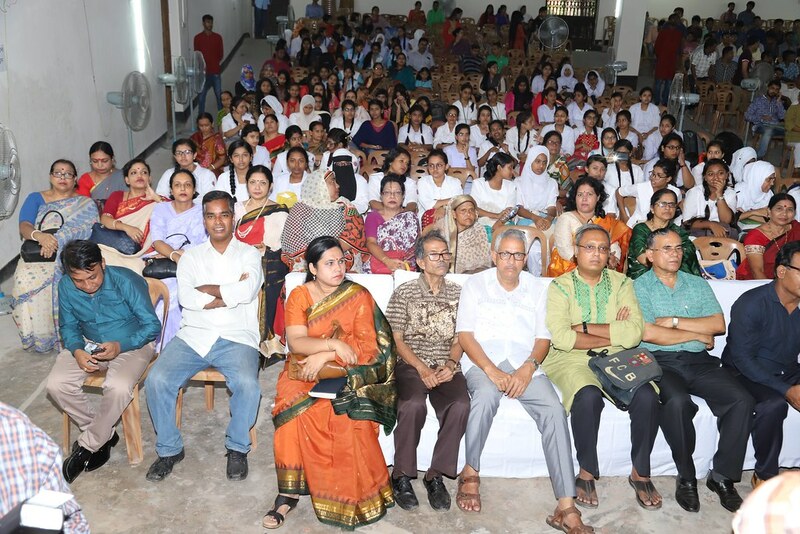 Approximately 500 people attended the seminar. 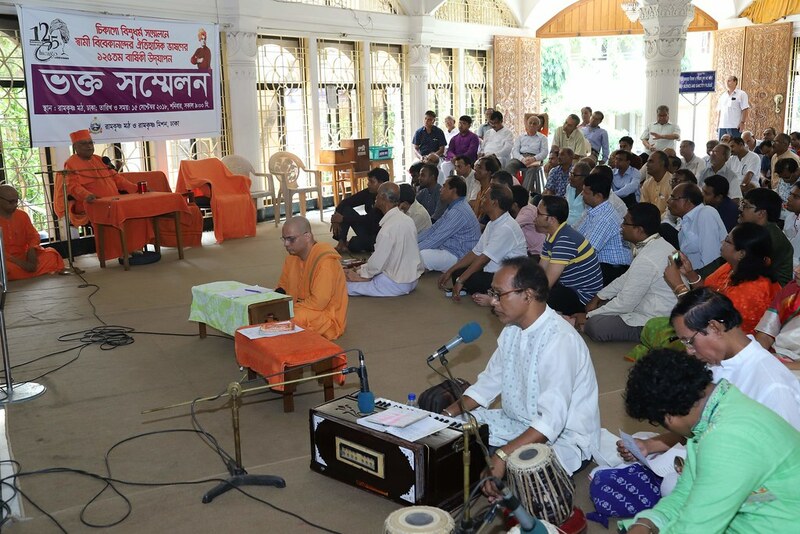 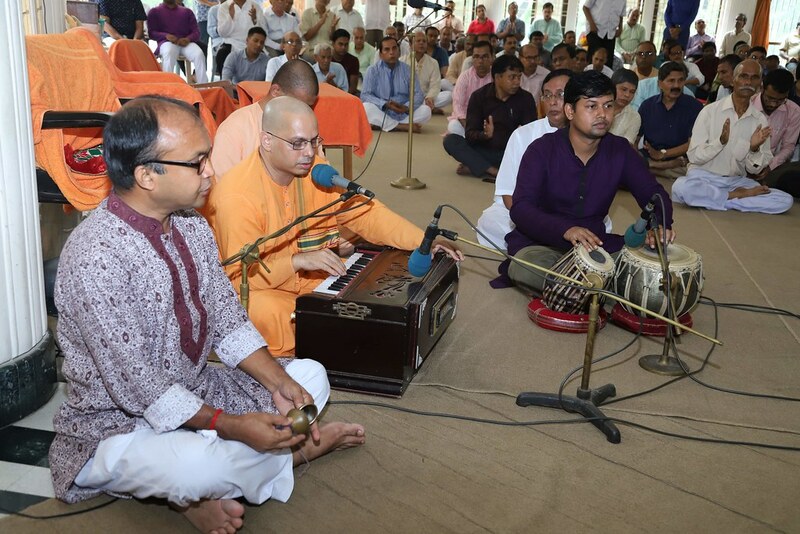 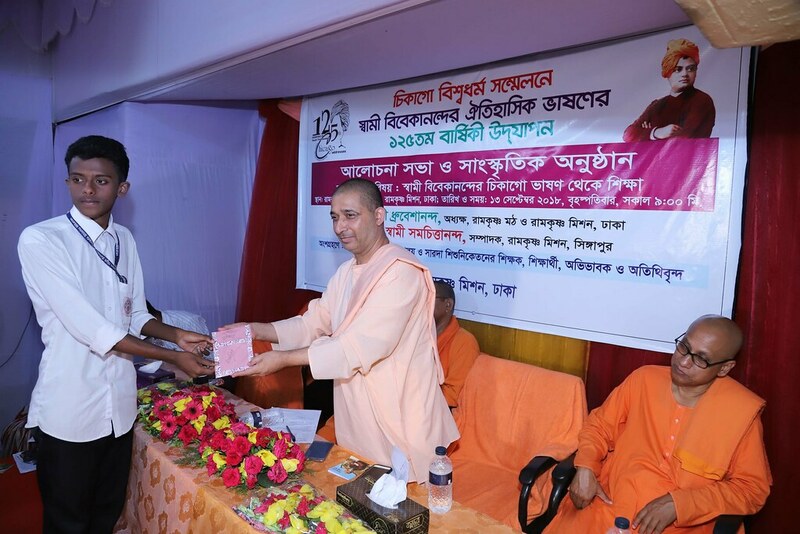 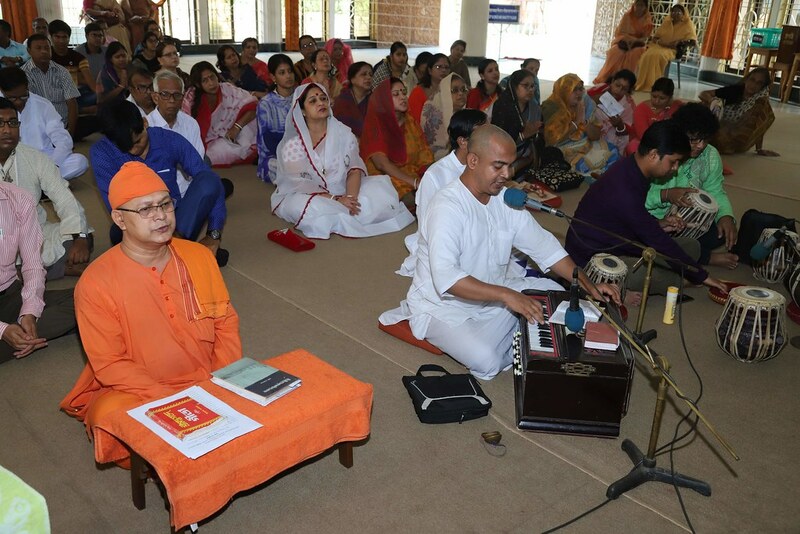 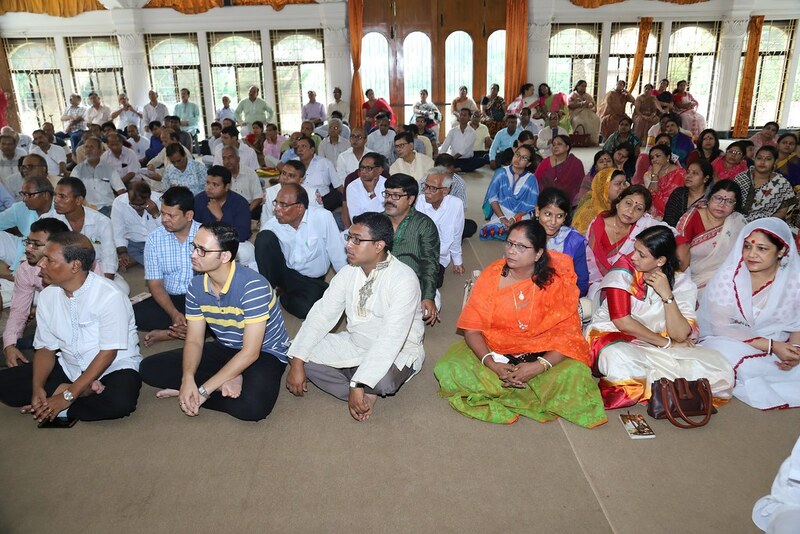 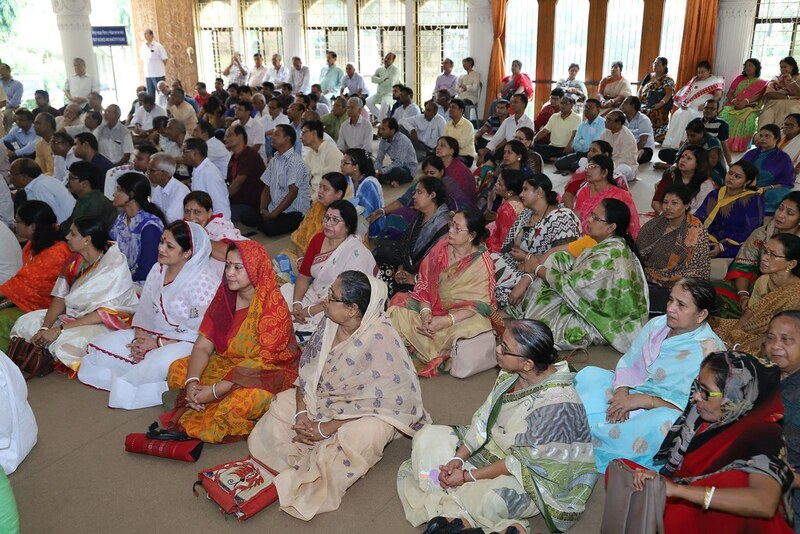 A Devotee Convention which was held on 15 September 2018 at Sri Ramakrishna Temple of Ramakrishna Math, Dhaka. 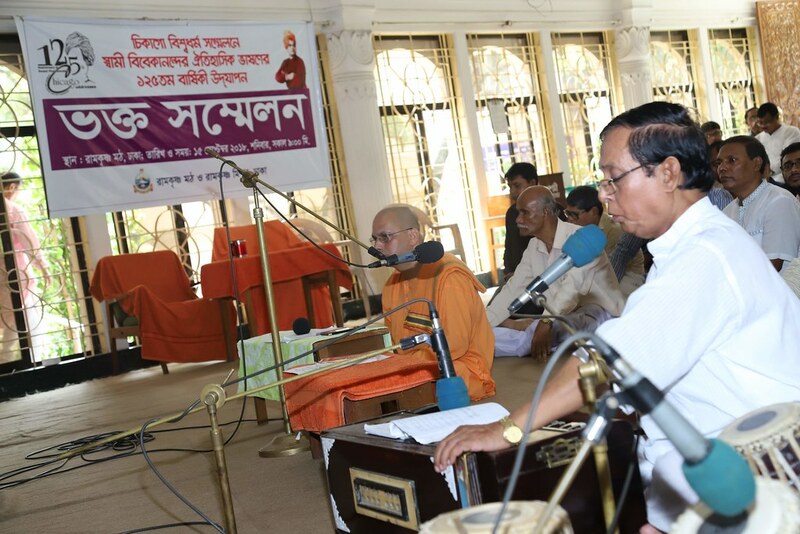 Srimat Swami Ameyananda Maharaj and Swami Samachittananda spoke on spirituality. 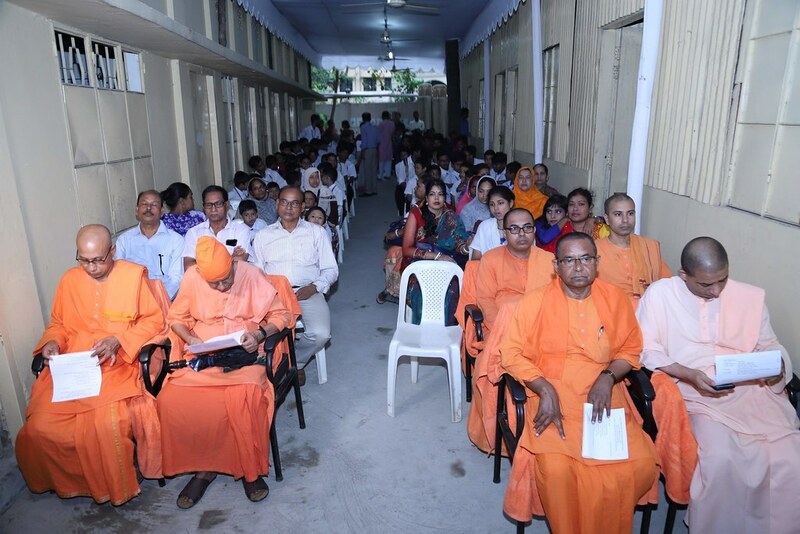 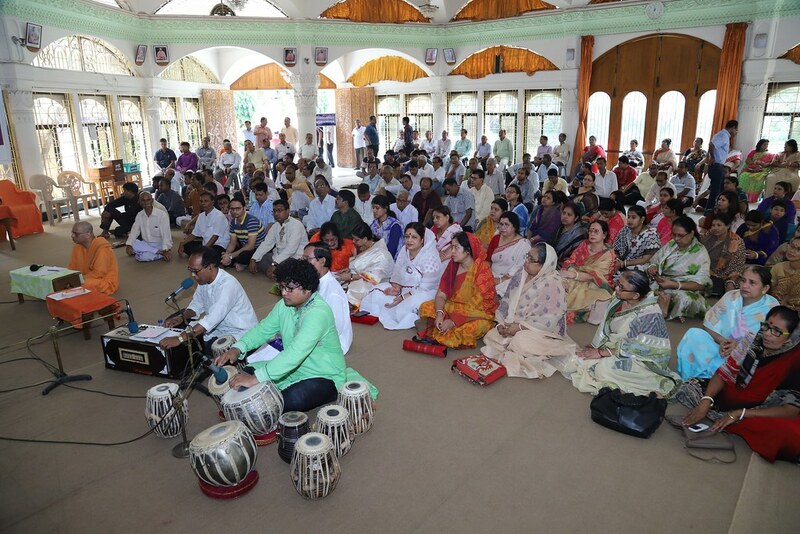 Nearly 250 devotees attended the convention. 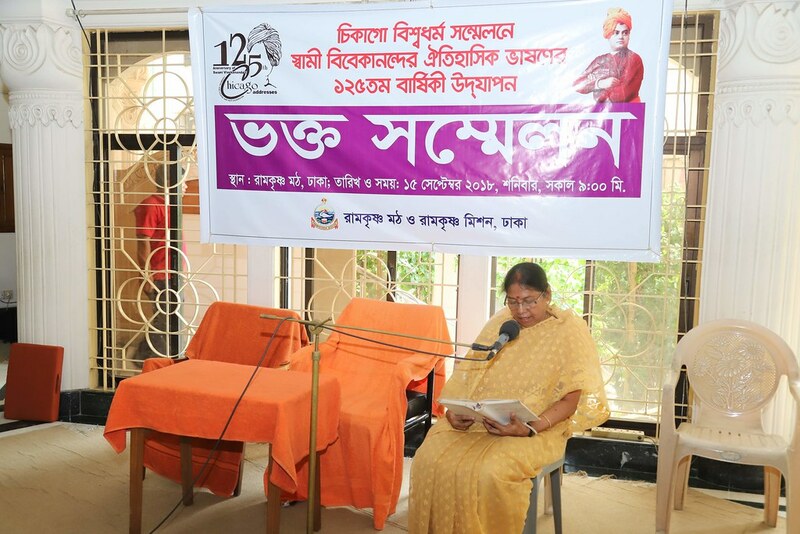 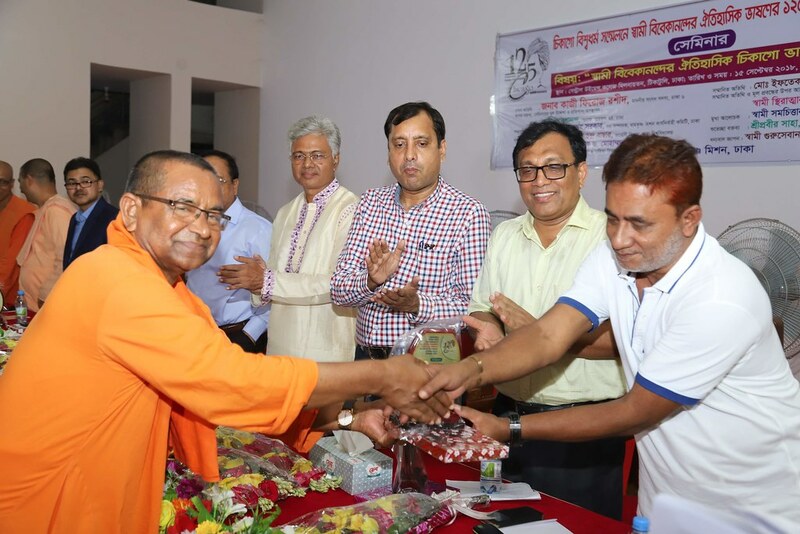 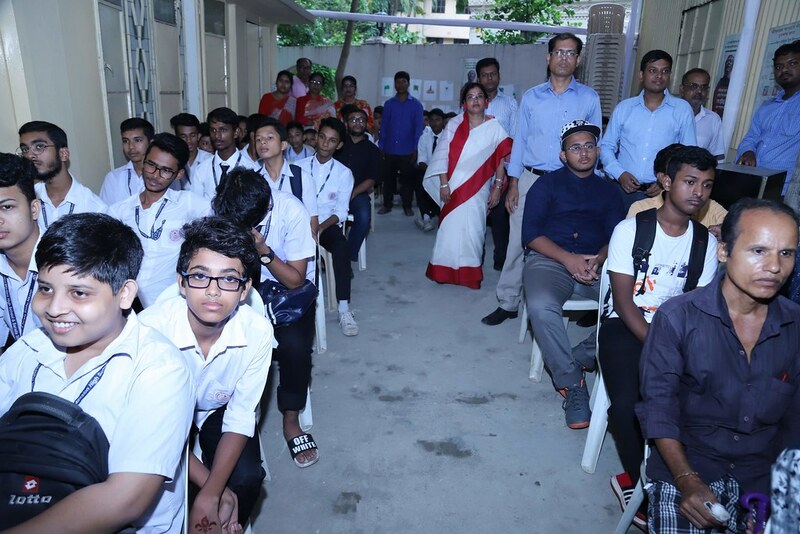 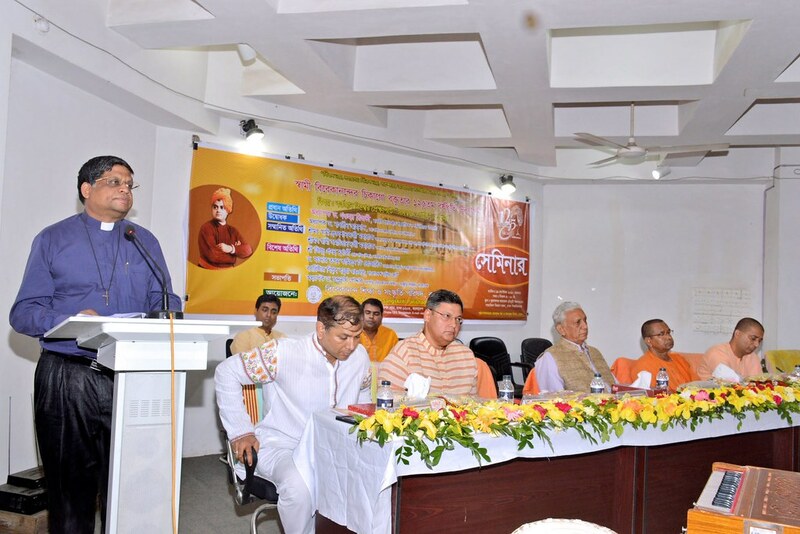 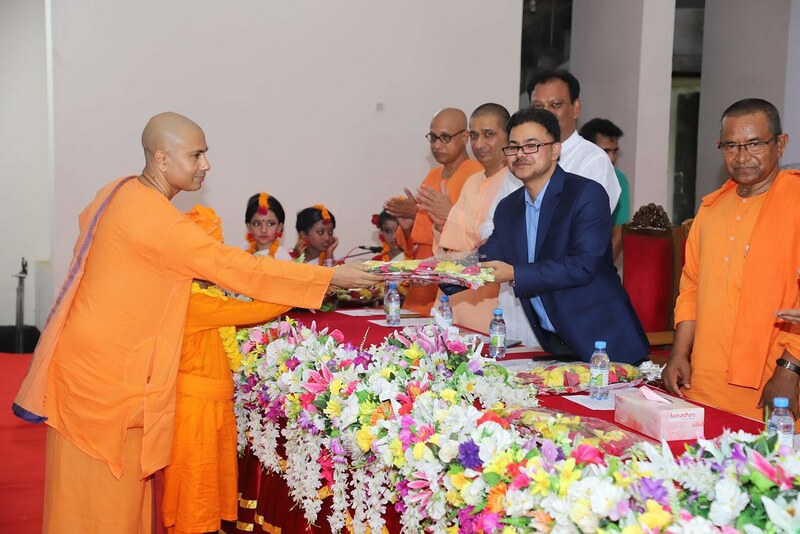 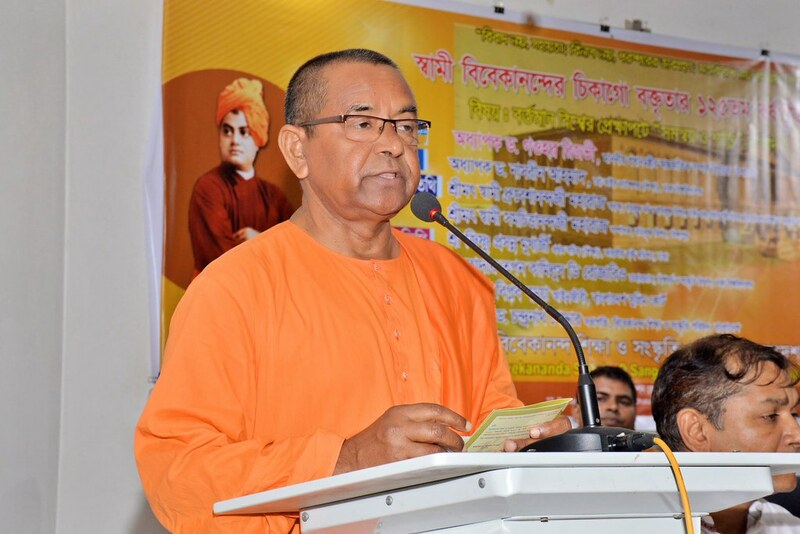 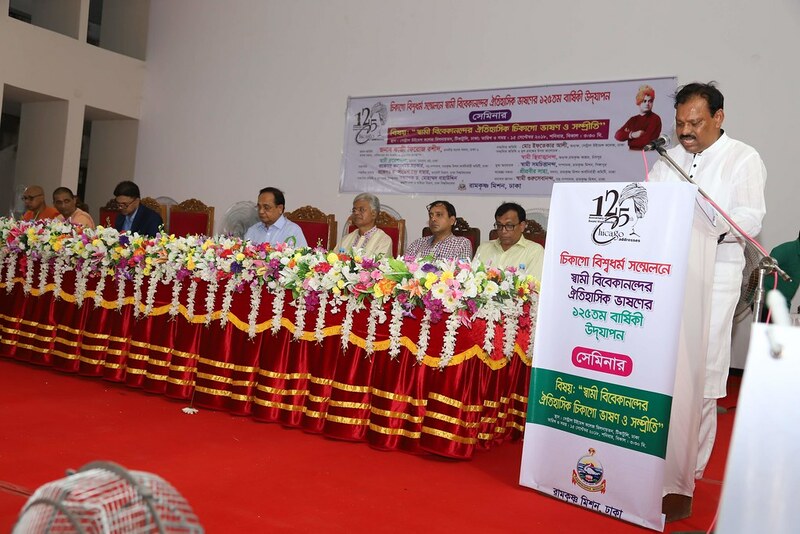 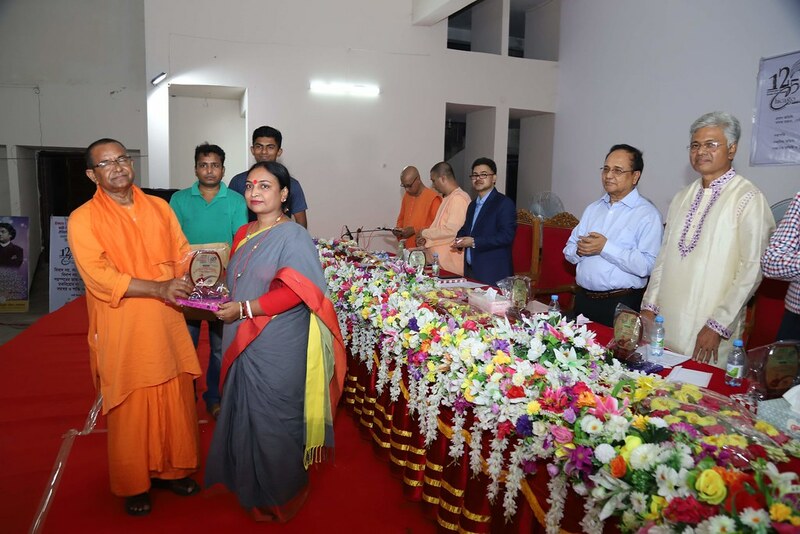 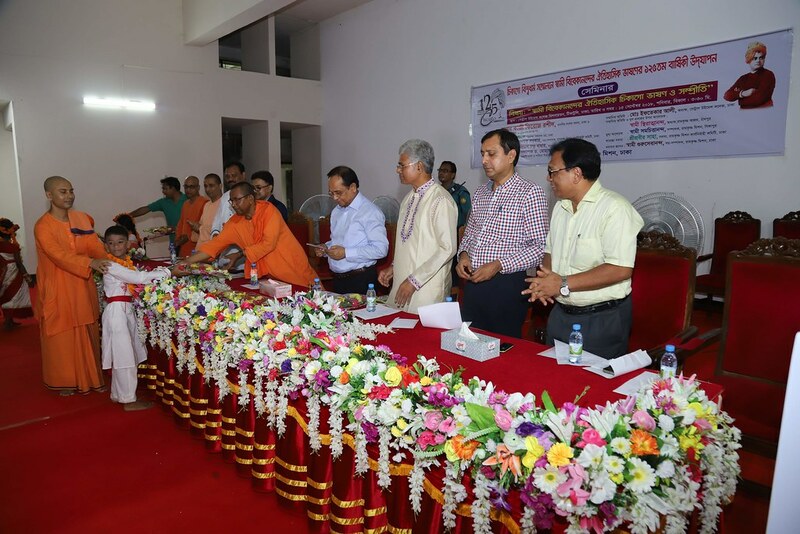 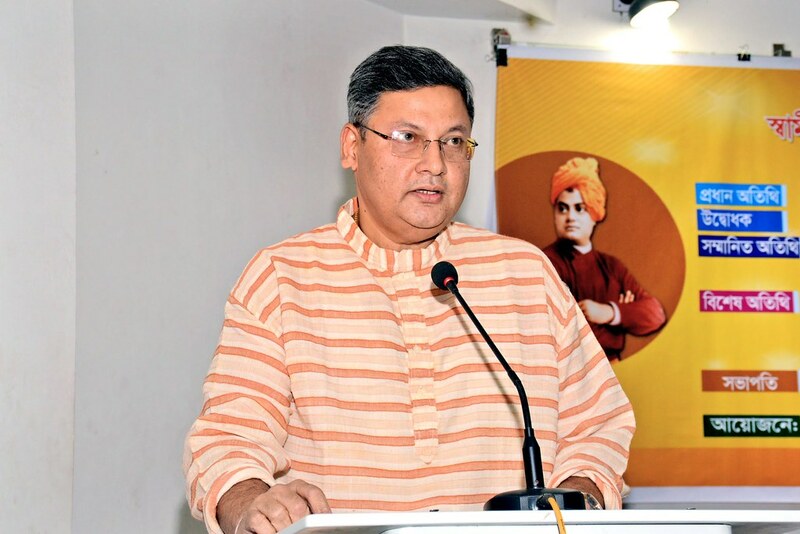 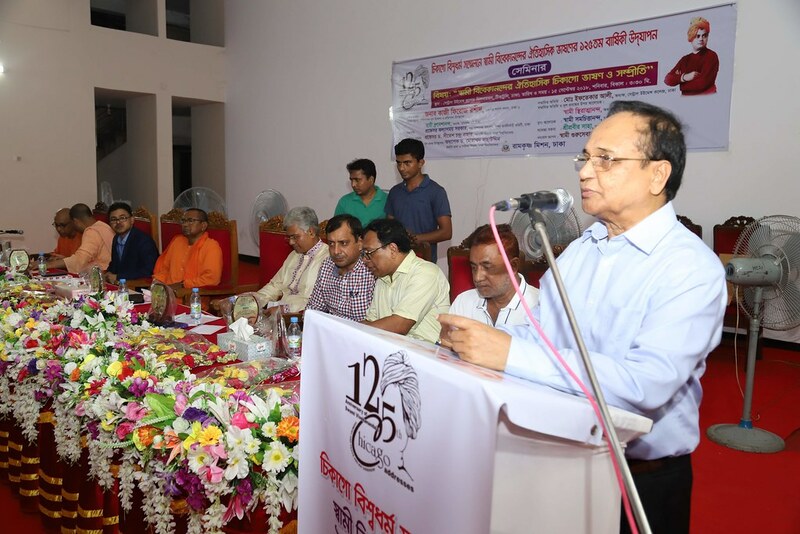 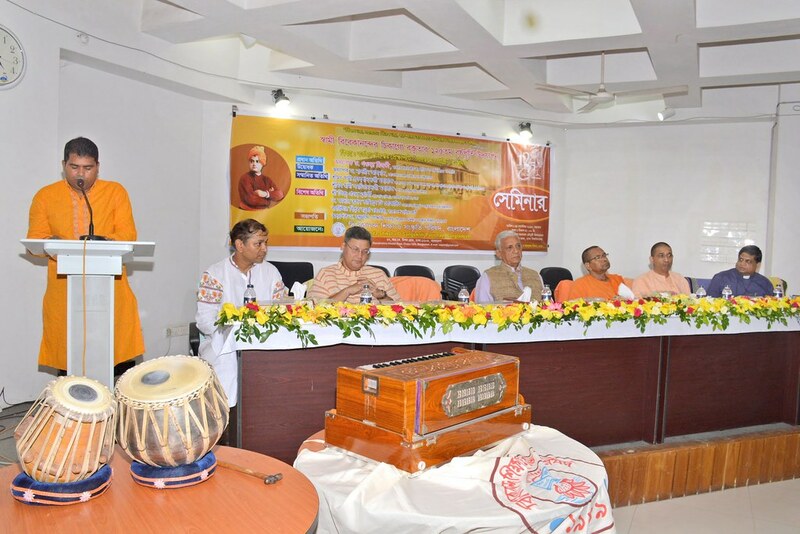 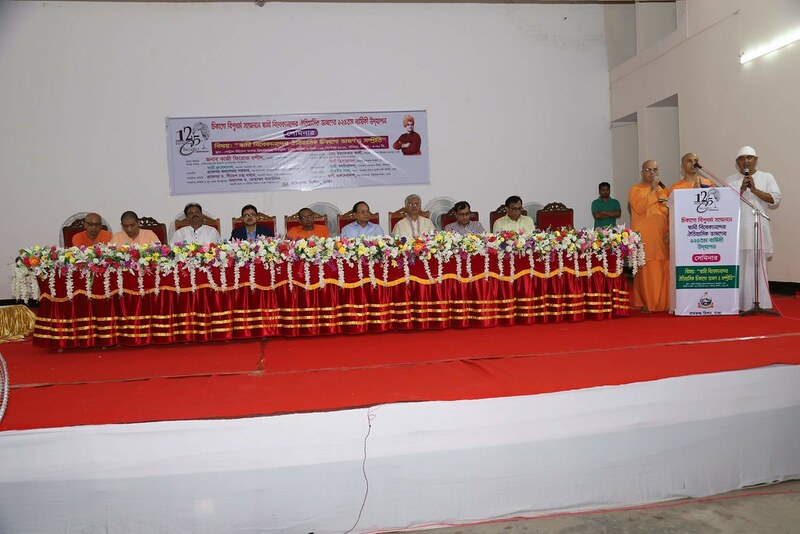 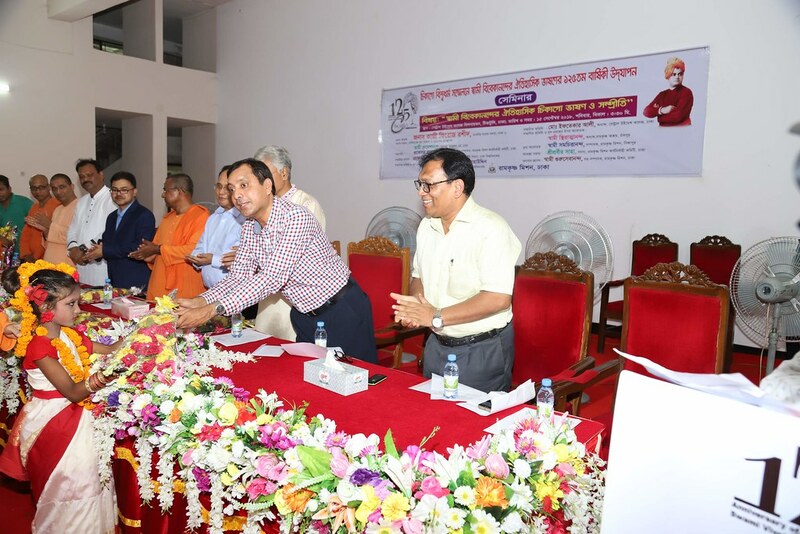 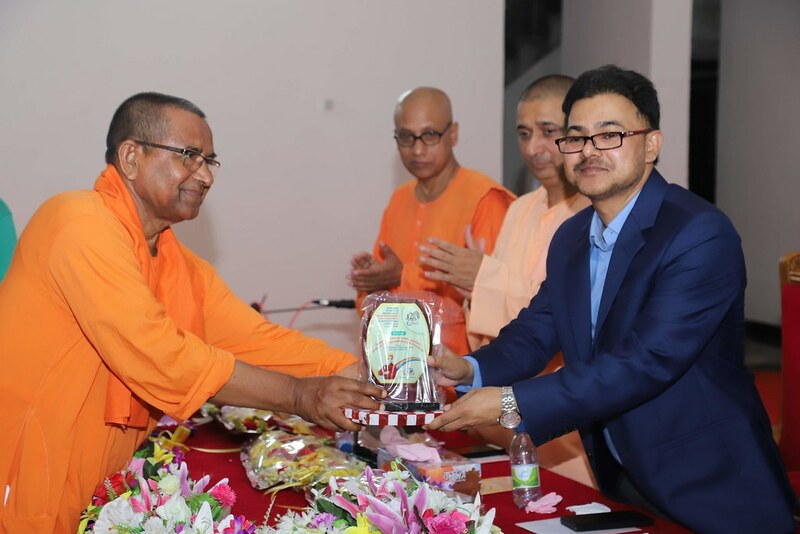 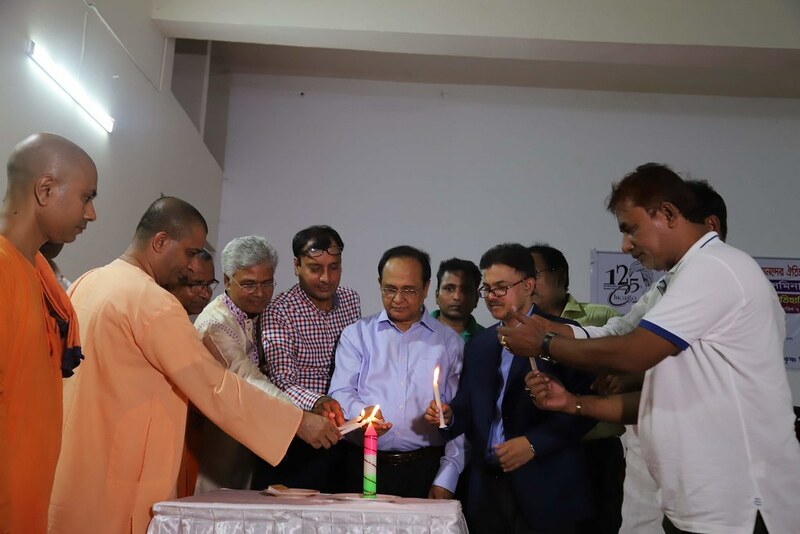 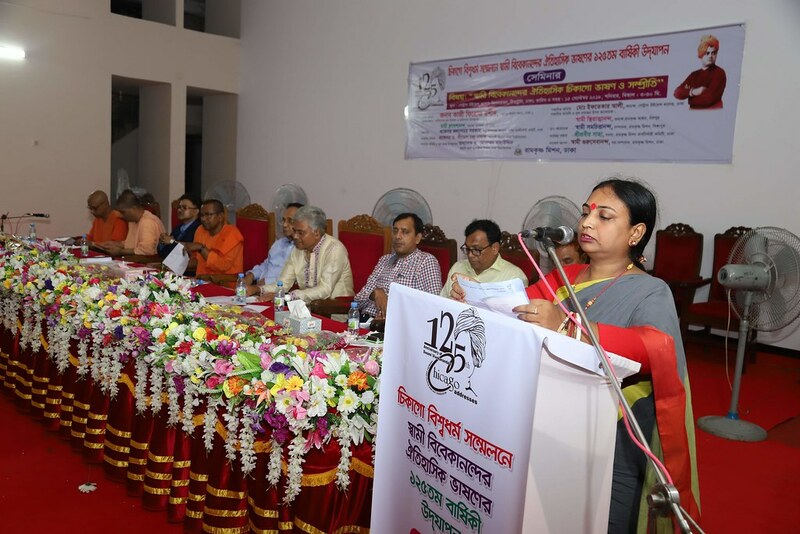 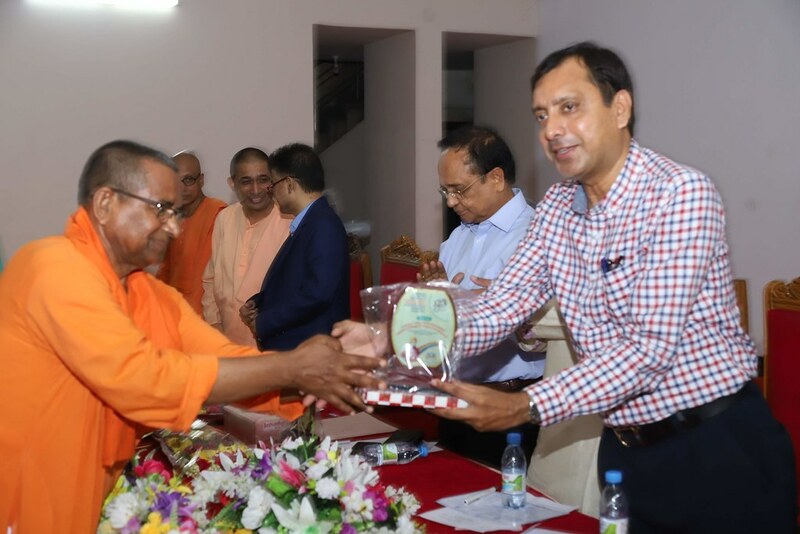 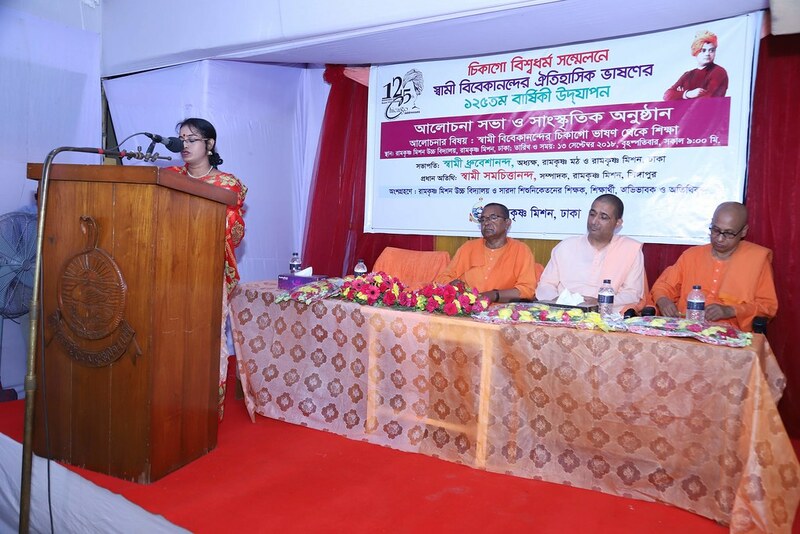 A seminar titled Swami Vivekananda’s Historic Chicago Addresses and Harmony was held on September 15, 2018 at Central Women’s College, Dhaka. 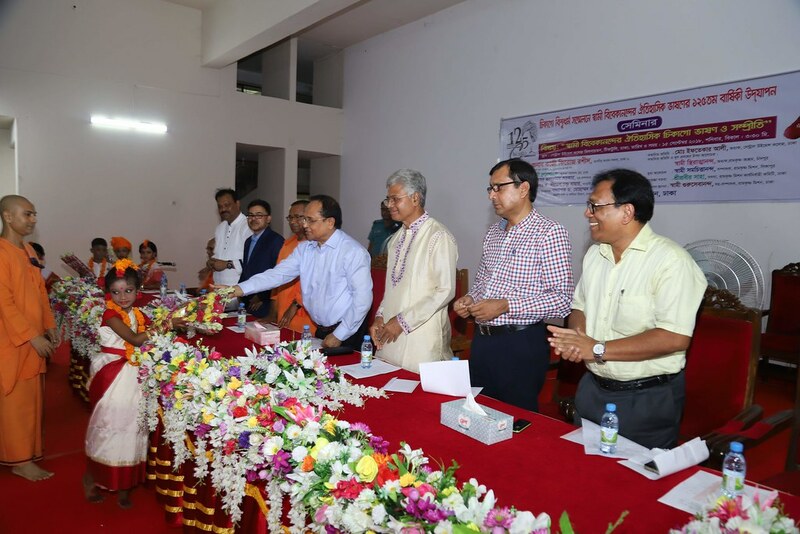 Mr. Kazi Firoz Rashid, Hon’ble Member of Parliament, Dhaka-6, inaugurated the seminar and addressed the function as the Chief Guest. 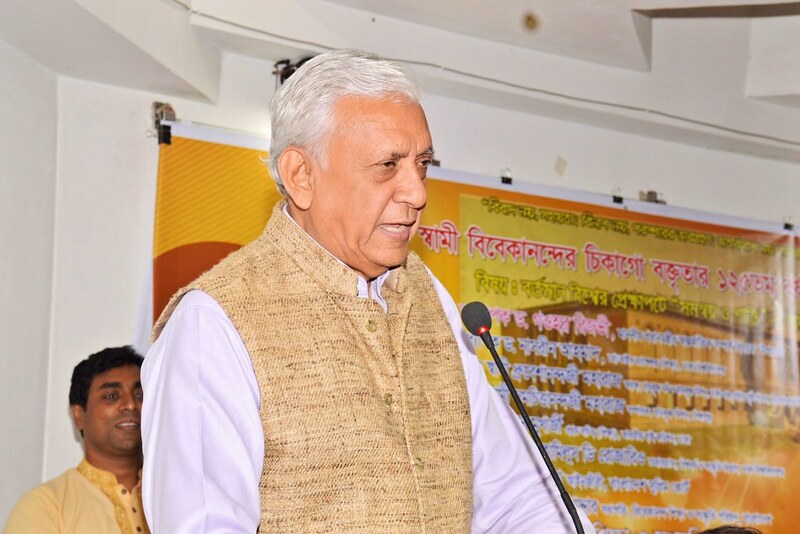 Professor Bahauddin, Dept. 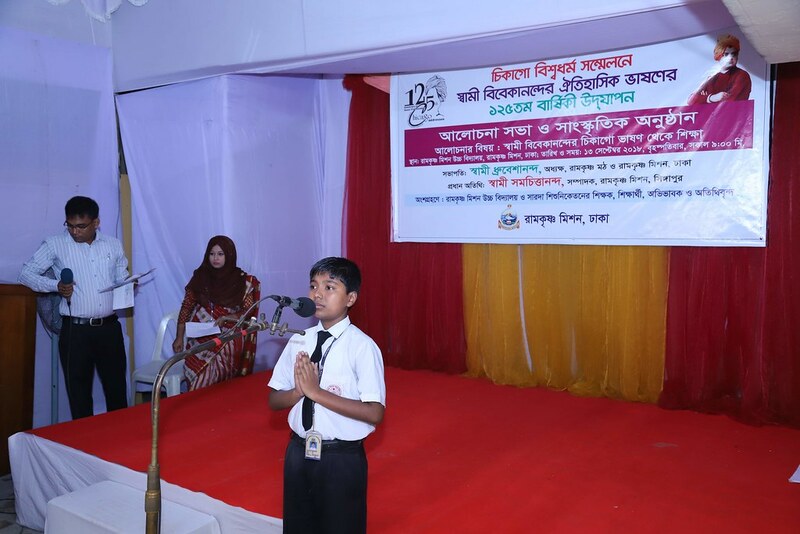 of Persian Language and literature, University of Dhaka, presented an article on the topic. 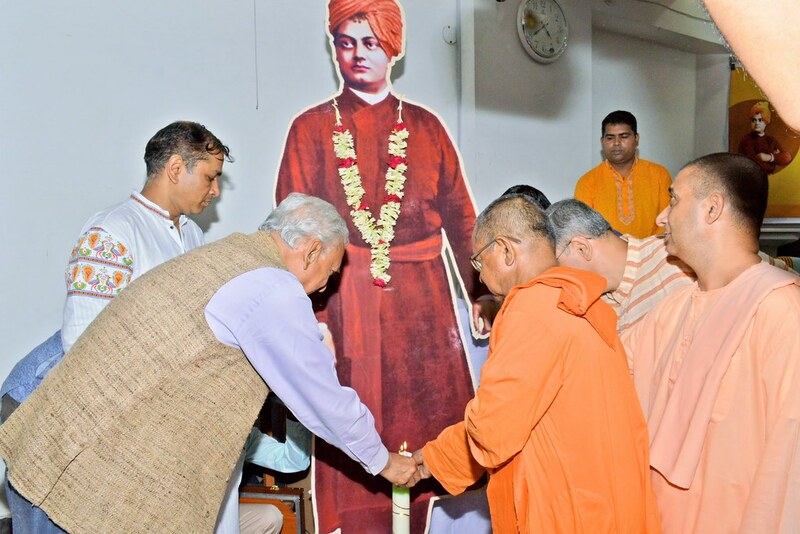 Swami Samachittananda, Swami Sthiratmananda, and Prof. Sitesh Chandra Bachar, Dept. 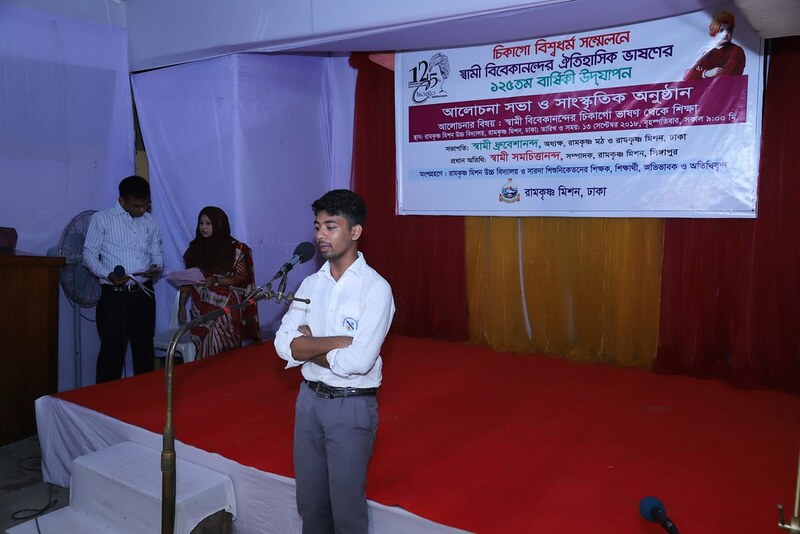 of Pharmacy, University of Dhaka addressed the seminar among others. 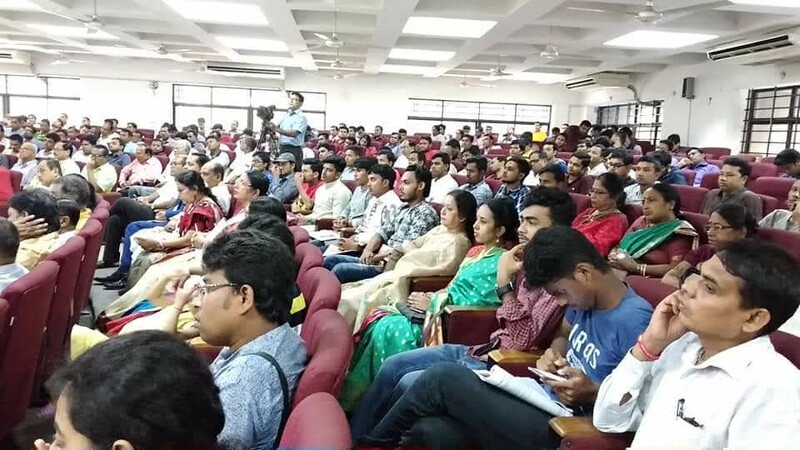 About 600 people including students, teachers of schools, colleges and universities, and dignitaries attended the seminar. 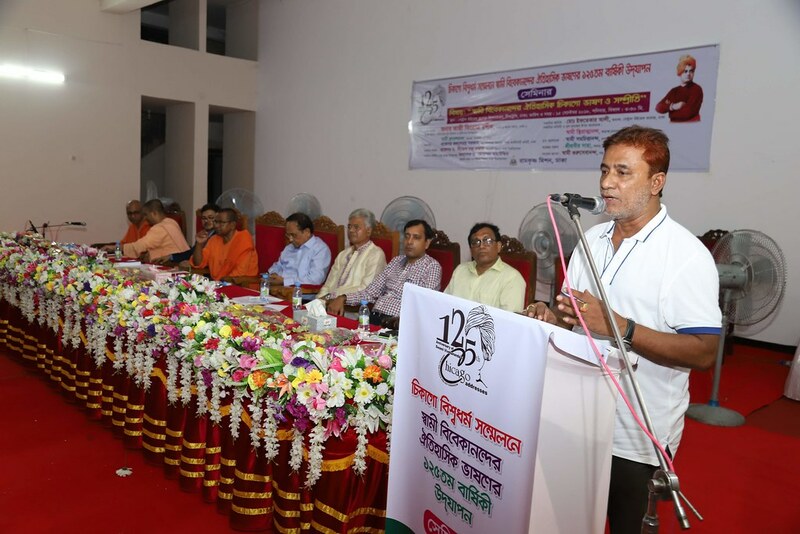 Esteemed dailies of Bangladesh publicized the news of the seminar with great significance. 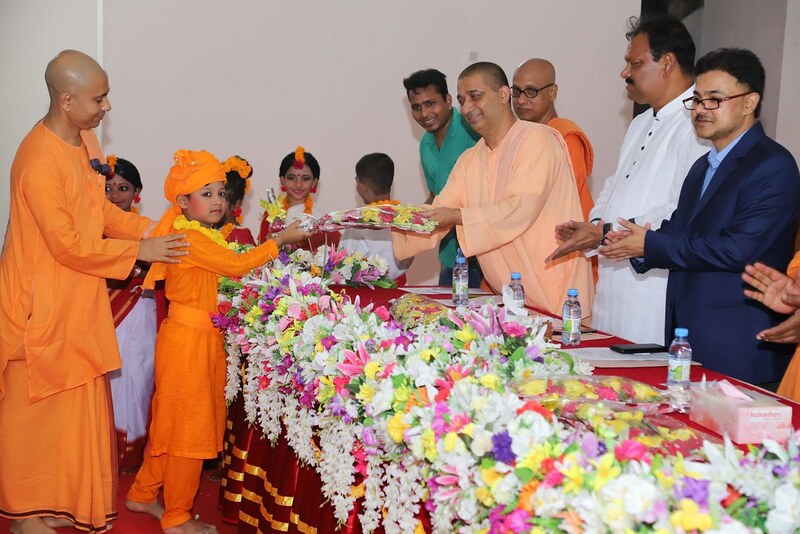 All ended peacefully.